Well, my last post was supposed to be my last post, but since the UCC has created a 4.5 min “Report from Durban,” I figured I should post that too. Just to bring everything to a close. Holy sh*t, it’s had 364 views so far! That’s a lot of people! Well, after only 33 hours of travel, I’m safely back in Toronto. It was a long journey, and I kinda feel like I don’t know what day it is (it feels like I missed Monday – how is that possible?). 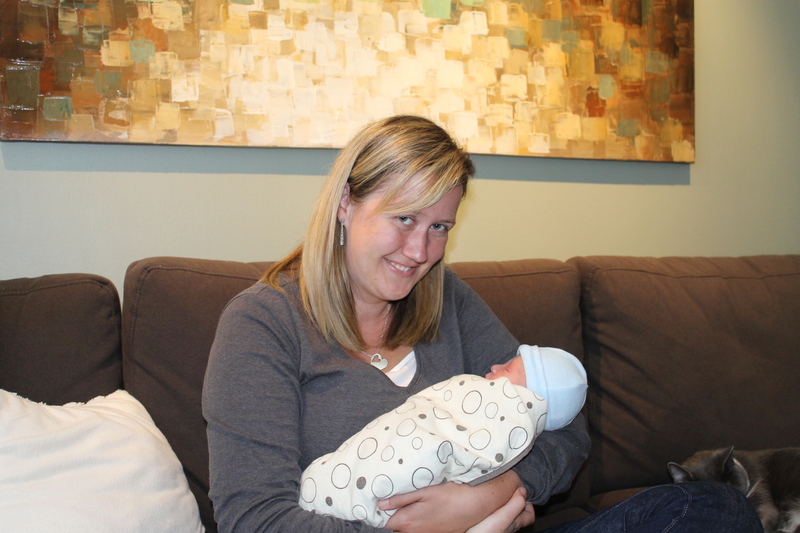 I’m back at work at Church House tomorrow, but first, this morning, I went to see my friends Sarah and Jon’s new baby Jacob, who was born while I was away, on November 21. 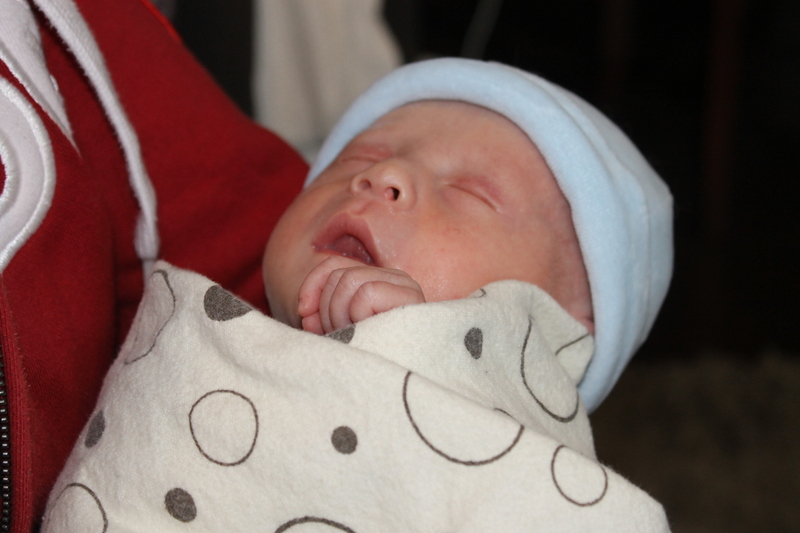 I was so excited to meet Jacob, as I’d thought about him a lot while I was in Durban. 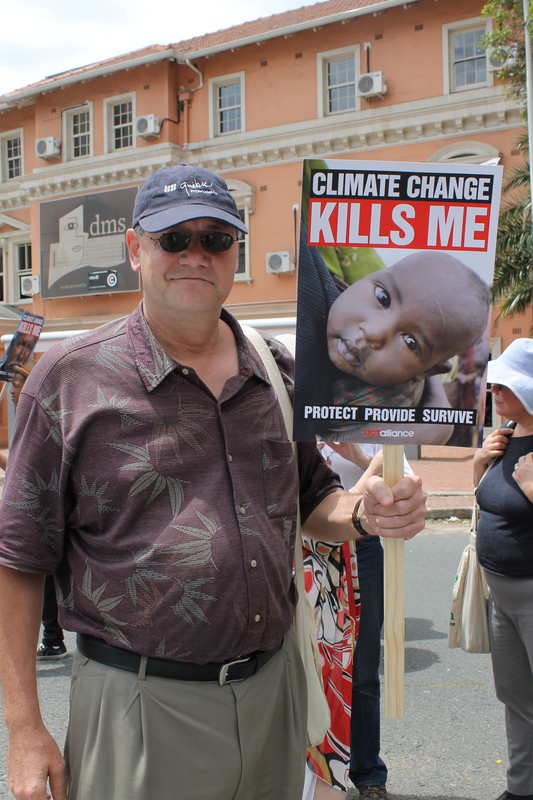 Sometimes, Durban felt very doom and gloom – a bit like “We’re all going to die!” Things are getting desperate; things are getting serious, and we really need to start taking concrete action, well before 2020. 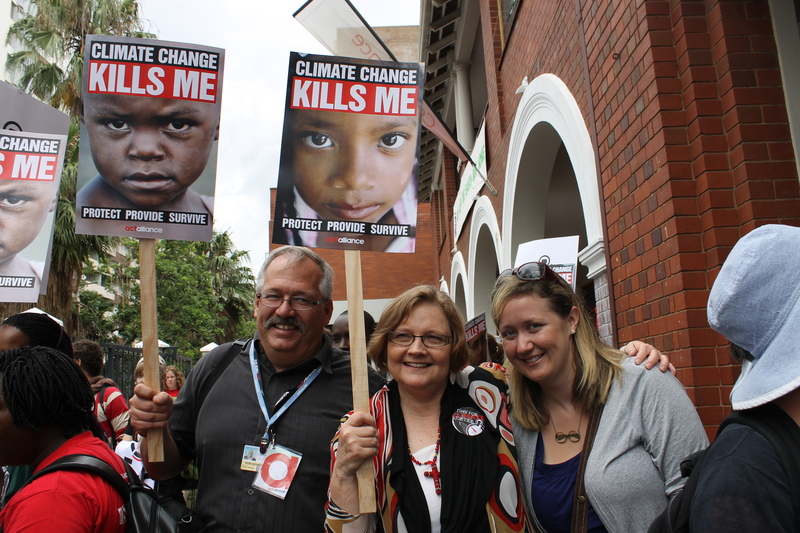 I heard several people talk about saving Earth for our children and grandchildren. Some even broke down, saying that they wanted their grandchildren to live in a world where they “wouldn’t be burned.” It got pretty heavy at points, and sometimes I even felt helpless. What kind of world are we bringing our children into? 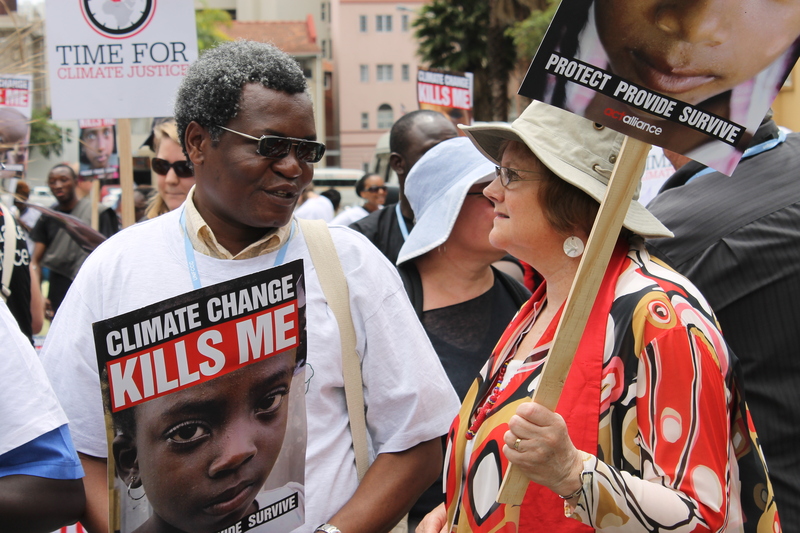 I remember one day in Durban, after the briefing with Ambassador Guy Saint-Jacques, I was talking to Moderator Mardi Tindal about having kids. I’d like to have kids, maybe in 5 years or so, but I sometimes wonder if I even should, with the state the world is in. The Moderator told me that many people also felt this way in the 1970s, when nuclear war felt like a very real threat. 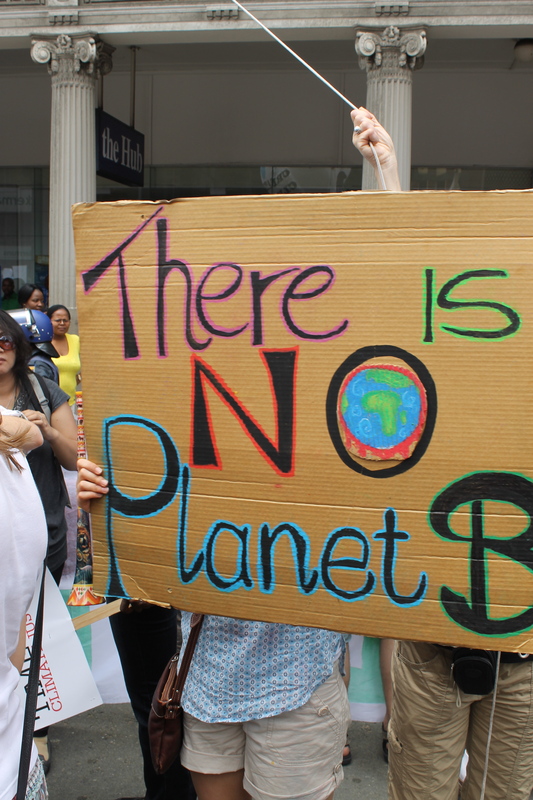 But, she said, “We still need to have hope.” Despite feeling hopeless at times, we need to hold on to our hope and our faith that we can change the course the world is on, and preserve Earth for many generations to come. When is the time of love to be born? Because, really, isn’t this what it’s all about?? My last few days in Durban were pretty eclectic. 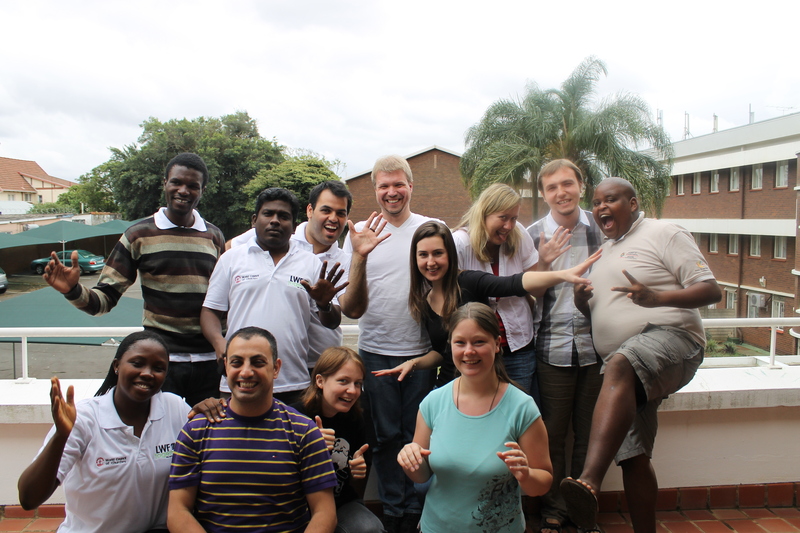 At the Centre, we spent most of the last 3 days working on our individual projects. These are projects related to eco-justice, and centred on youth, that we will be implementing back in our home countries. We presented them to each other in small groups, giving each other (hopefully) constructive feedback. Friday afternoon was free, so naturally a few of us went down to the ICC (where the COP is being held). Our first stop was at the Occupy COP site, where we affixed our sign from the previous weekend’s rally to the fence surround the site, facing the ICC. Next, Claire (UK) and I went into the ICC to see what was happening. The sessions were closed to us, even though we were accredited, at this point because only certain key people were allowed into the negotiations. 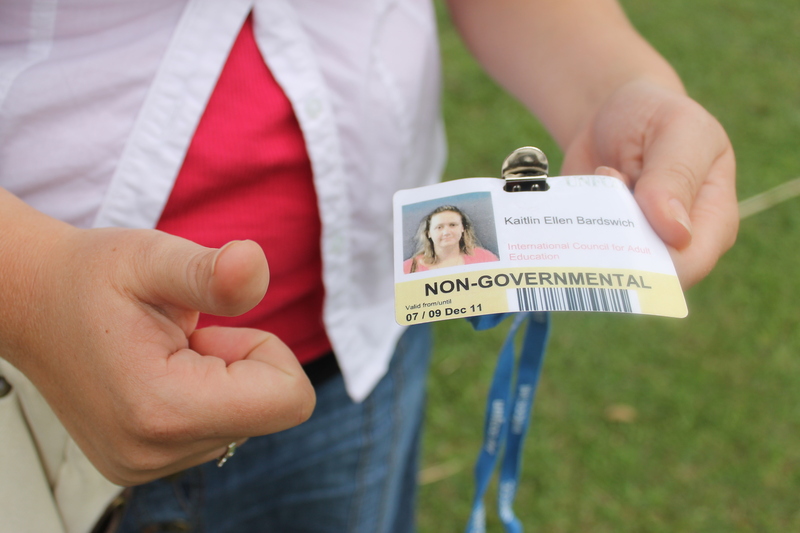 Claire and I took a photo of our accreditation badges, just in case they got taken away at a protest. 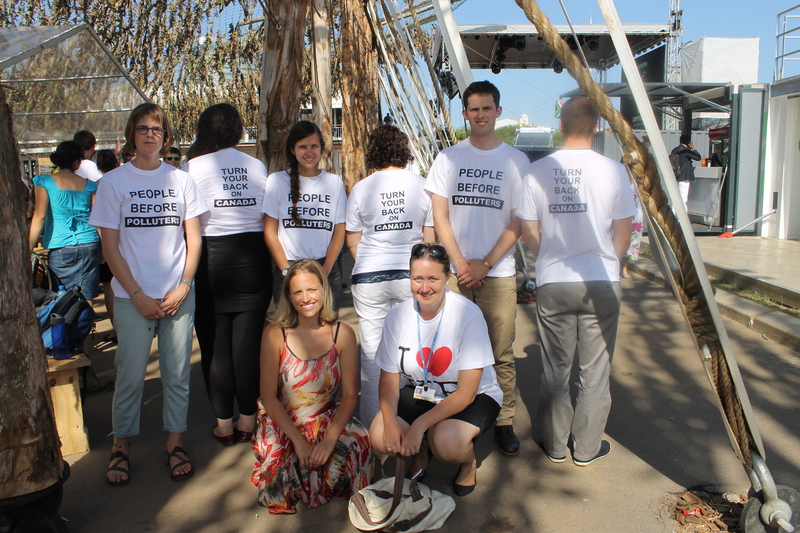 Mine was not; Claire’s was, when she, and a group of others, sat down in the ICC in silent protest. Again, how is this a security threat?? And how is Canada’s position at these negotiations not a security threat? 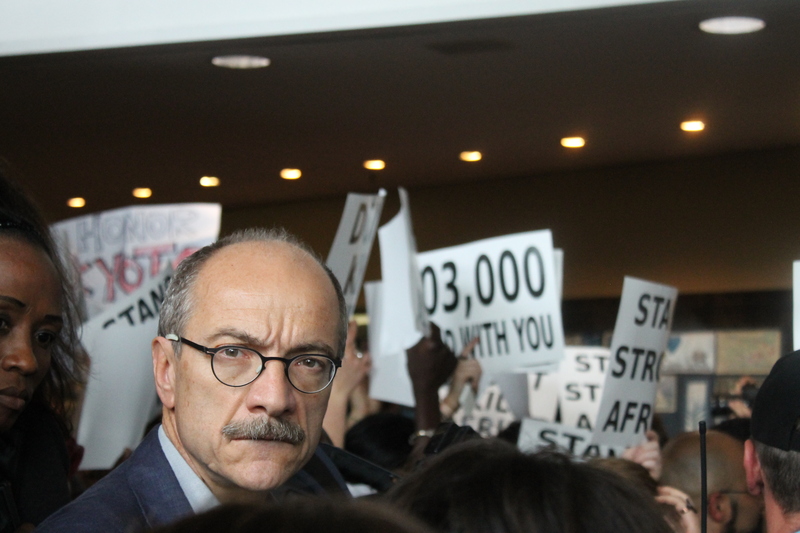 Inside the ICC, there was a big protest near the Plenary. Interested, we went to investigate, and met some of our fellow Youth for Eco-Justice participants. 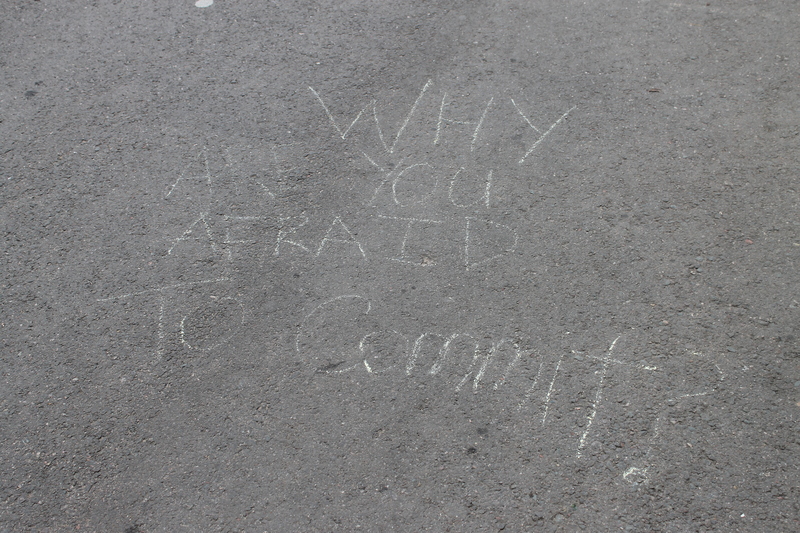 When I was leaving the ICC, I saw this simple message written on the pavement in chalk. 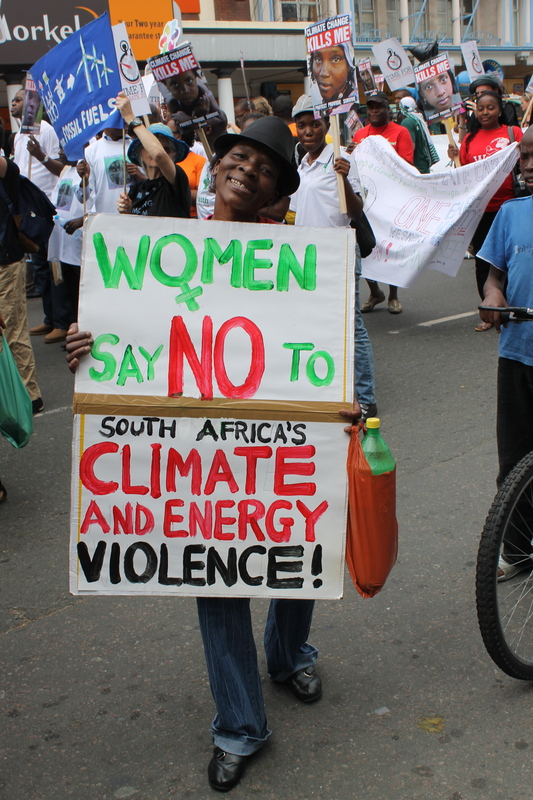 The conference agreed to start negotiations on a new accord that would put all countries under the same legal regime to enforce their commitments to control greenhouse gases, according to Maite Nkoana-Mashabane, South Africa’s foreign minister and headn of the 194-party conference. The agreement would take effect by 2020 at the latest. 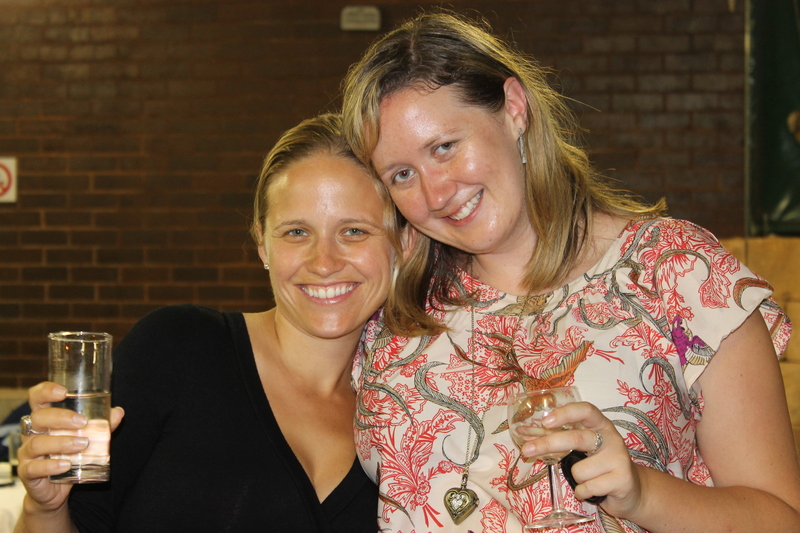 We spent Friday night with a celebratory dinner and party. 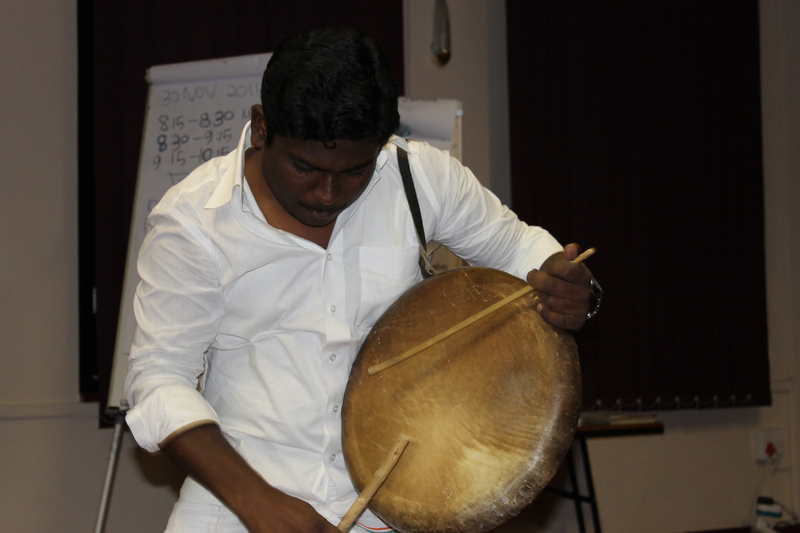 Perhaps we were a bit premature in the celebrations, since we didn’t yet know what would come out of this COP in Durban, but we were celebrating the successful Youth for Eco-Justice program. Caroline and I – travel buddies! 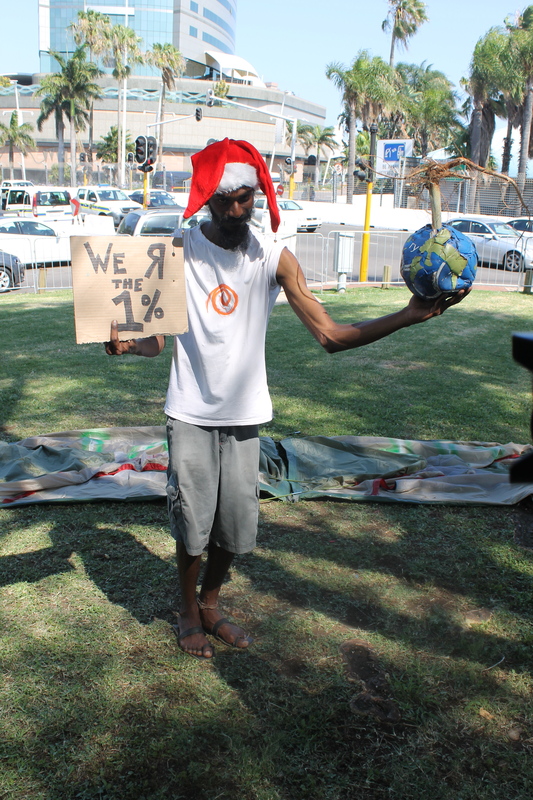 On Saturday, we did some last-minute Christmas shopping at a market at the Moses Mabhida Stadium. 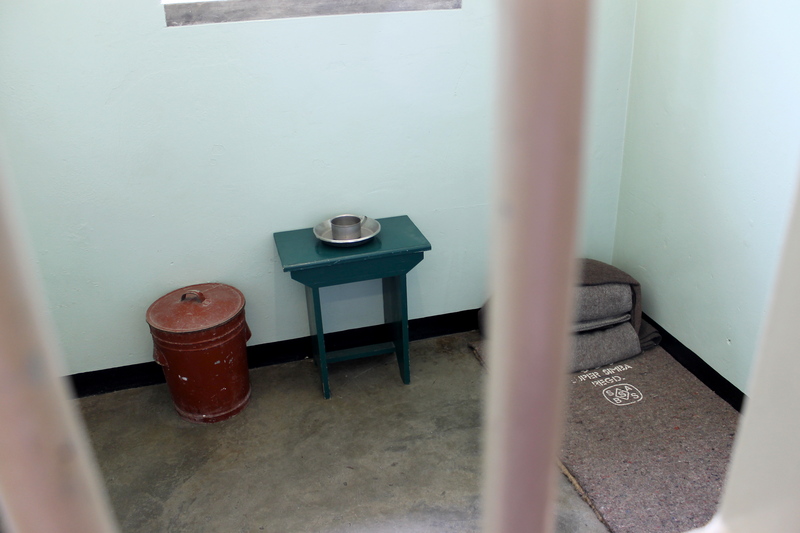 That afternoon, I went to the Kwa Muhle Museum, Durban’s Apartheid museum. 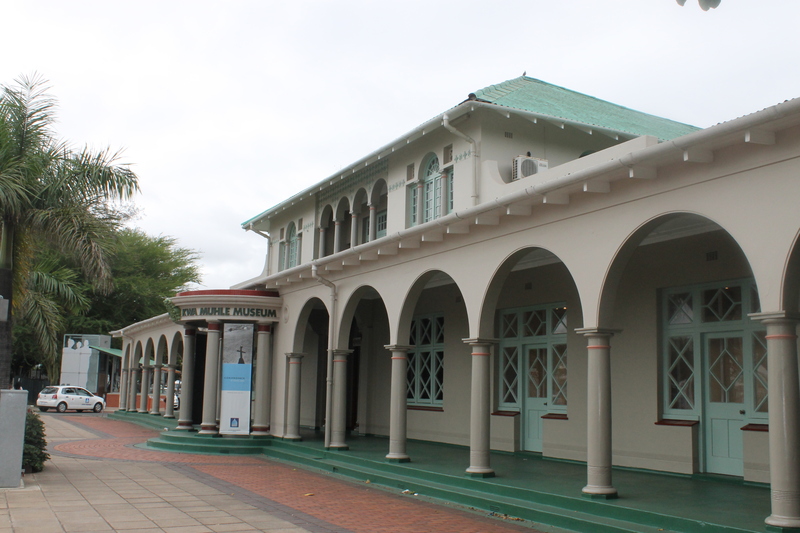 Interestingly, it is located in notorious building that served as the Native Administration Department under Apartheid, which controlled the affairs of the African urban population in Durban. 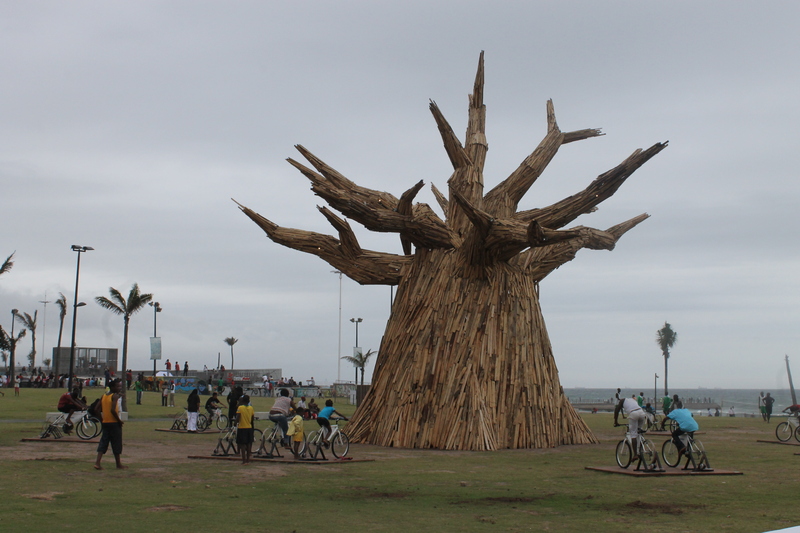 A wander along the beach afterwards led us to one of the cooler installations on the beachfront – a tree with lights that are powered by cyclists. It was pretty awesome. 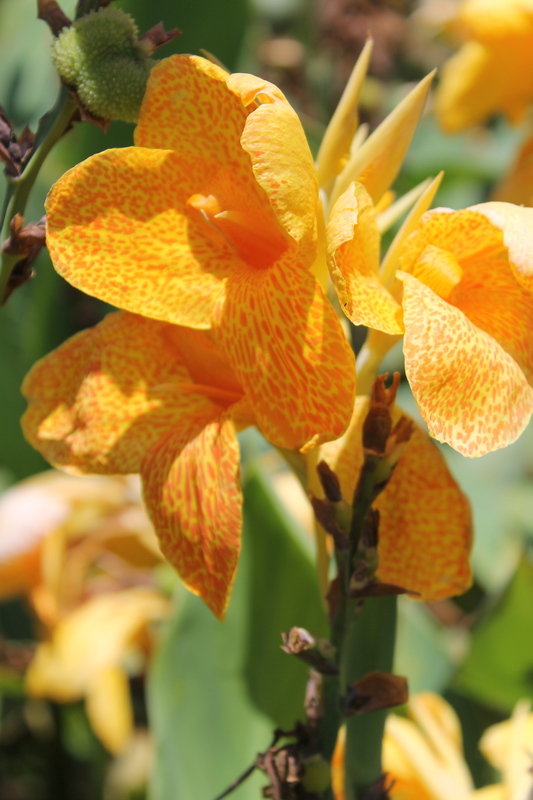 And Sunday morning was spent communing with nature at Durban’s botanical gardens, the oldest botanical gardens in Africa. At 3 pm, I set off for my nearly 1.5 days of travel back to Toronto. 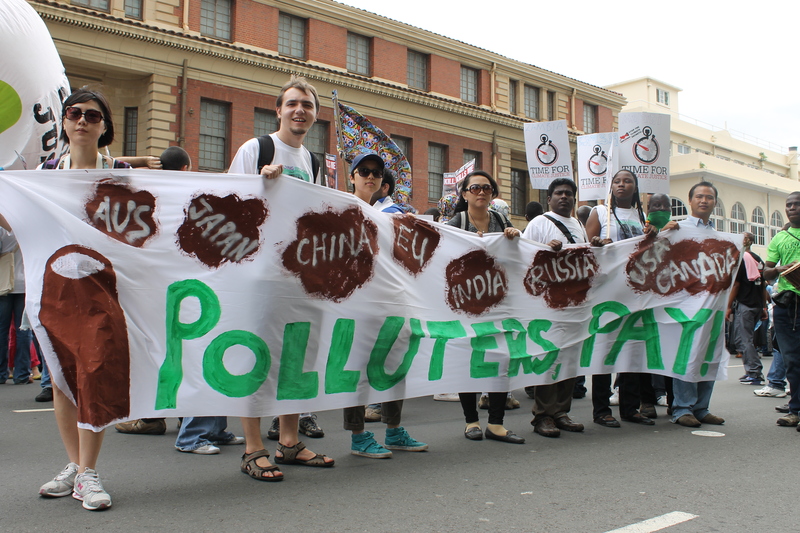 Today, Canada formally announced its withdrawal from the Kyoto Protocol. Many countries have criticized this decision. Canada may yet choose to participate in a miracle. But clearly it will not do so on the schedule for which we have prayed, and certainly not in time for December 25th 2011. We will continue to act and pray with both the longing and hope of Mary. For shame, Canada. For shame. 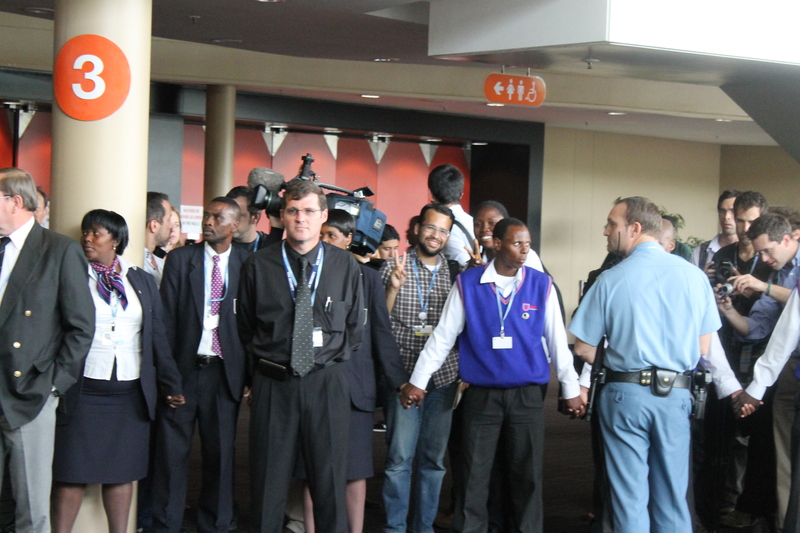 Of course, this peaceful, silent protest was a security risk and they had to be ushered out. All they did was stand. 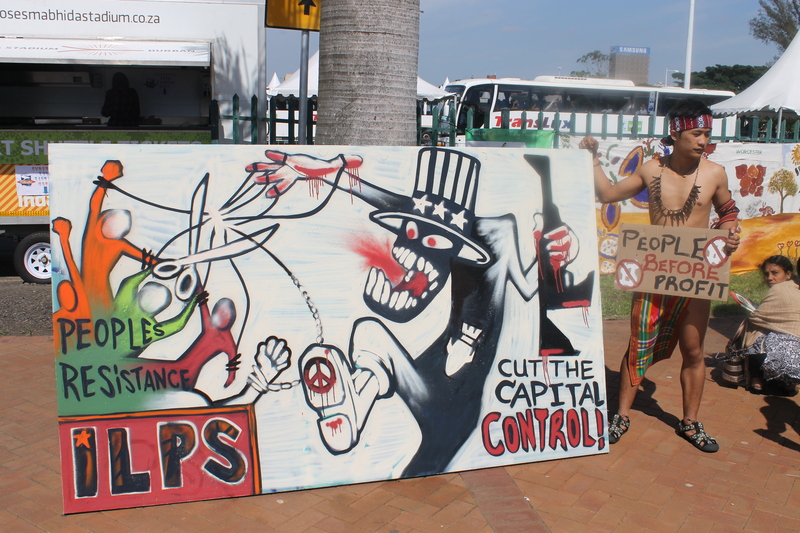 It was the most effective protest I’ve ever seen, and one that made the security officers, and COP 17 officials, seem even more ridiculous. Check out the video of Kent’s speech below. At about the 3.30 minute mark, you’ll here a round of applause – listen to how long it is! And it was much louder from where I was standing; you couldn’t even hear Kent. That’s for these amazing youth. As soon as they stood up, and I was just behind them in the back corner, everyone around started taking photos (and hopefully someone got some video). 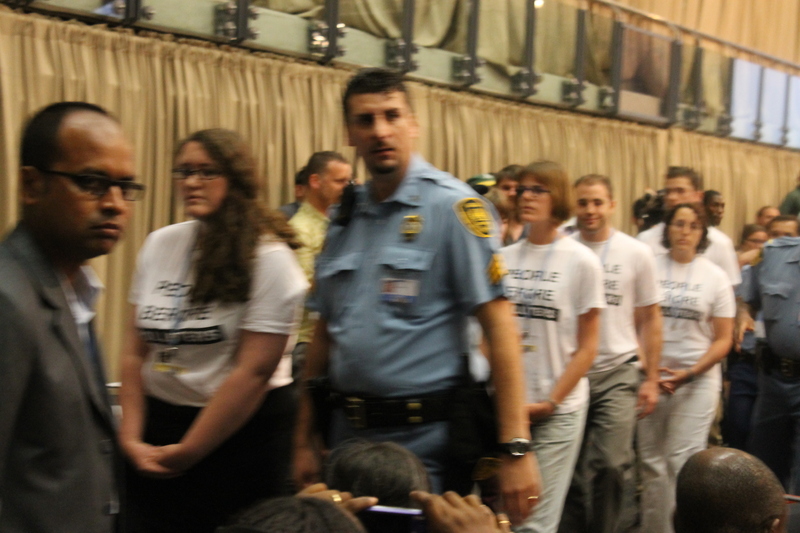 I also took photos of them being led out, and was yelled at by the security guard to stop filming them. They were taken out a back exit, and then when I went to get back to my laptop, I was stopped by another security guard until I showed him my computer. Craziness. 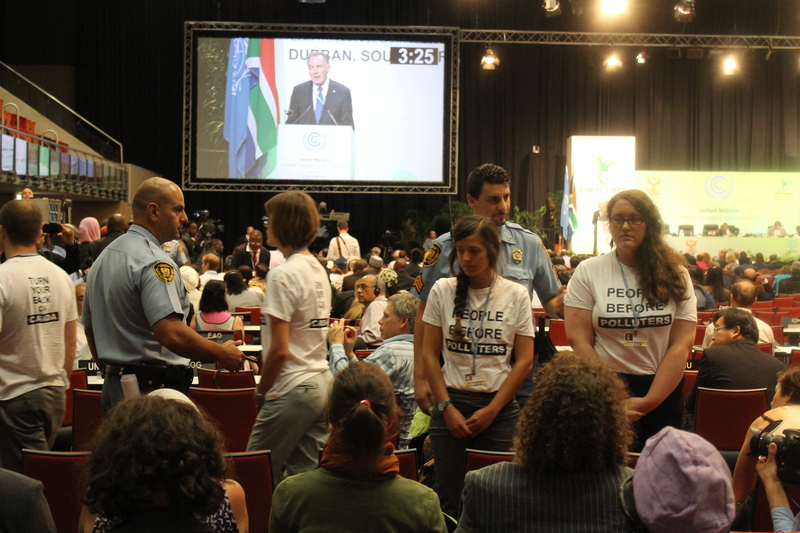 The six youth being escorted out. 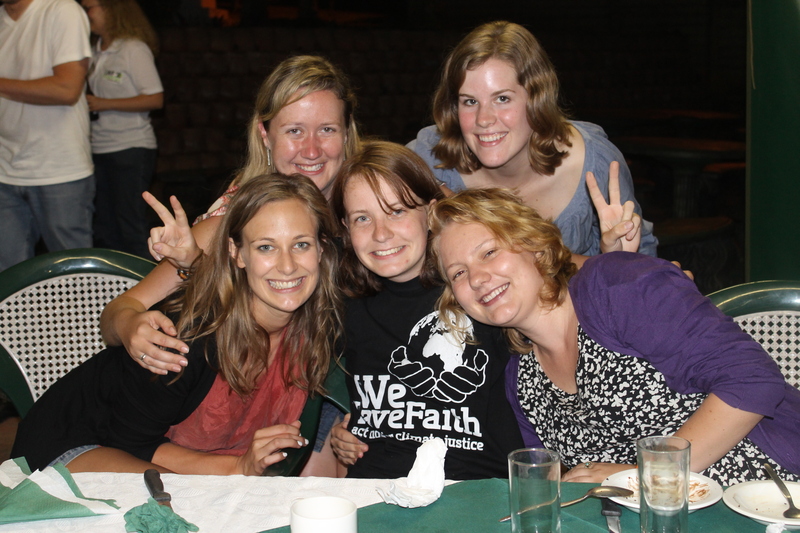 Second from the right is Brigette DePape (the “Rogue Page”). Peter Kent is onscreen in the background. 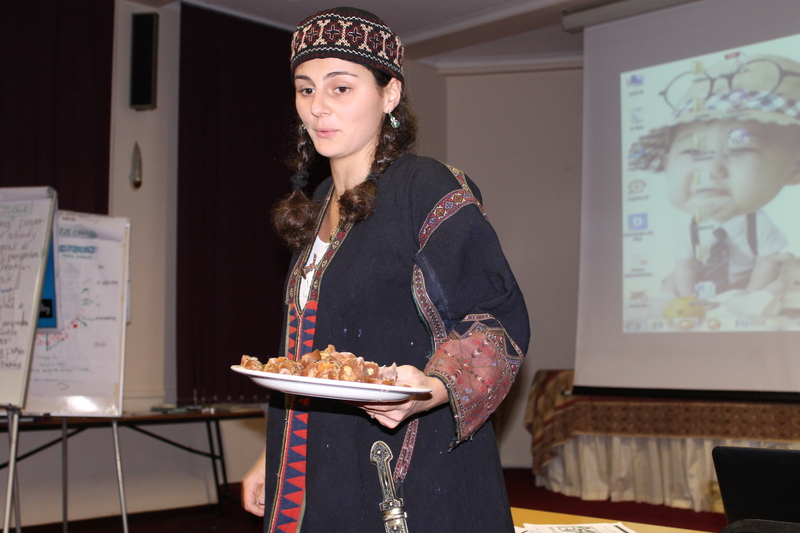 General Secretary of the Mennonite Church in Canada, Rev. Willard Metzger, wrote a great blog about yesterday. Additionally, Moderator Mardi Tindal’s excellent blog post is getting some publicity on Canadian social media sites, particularly Twitter. The Globe and Mail reported it yesterday, and today they have an article an about Kent apparently changing tack and seeking a binding climate treaty by 2015. There was another article about the youth here. And to hear about it in the 6 youths’ own words, read about it here or listen to a podcast here. After meeting up with Caroline for some lunch, we ran into some of the youth from the Canadian Youth Delegation, including the six youth who participated in the protest. They told us that, after they were escorted out, they were grilled with questions for about 10 minutes, with the security guards asking them who they were, what organization they were with, who their leader was, etc. They just kept quiet, and were eventually escorted out via the security exit and had their accreditation revoked. 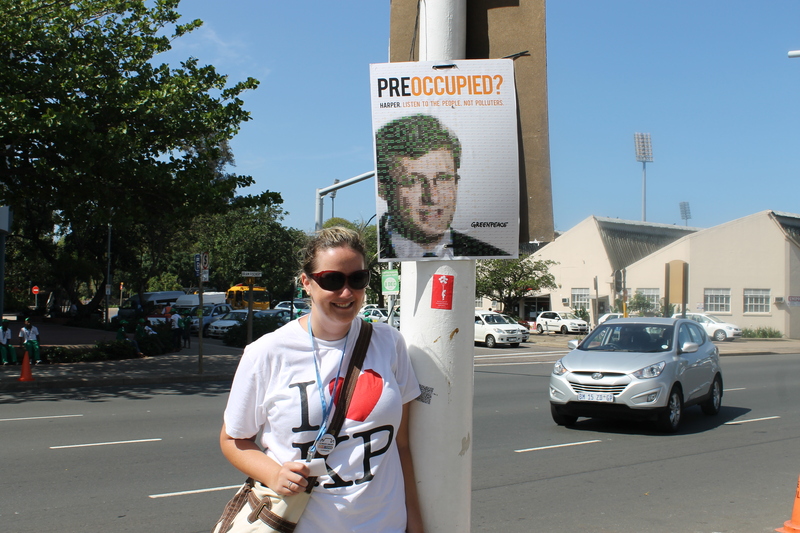 Later on, we came across one of the signs I’ve mentioned previously, depicting Stephen Harper. Of course, I had to get a picture with it! Then this morning, I skipped out of the Youth for Eco-Justice program briefly to attend one of the daily briefings with Guy Saint-Jacques, Canada’s Chief Negotiator and Climate Change Ambassador. 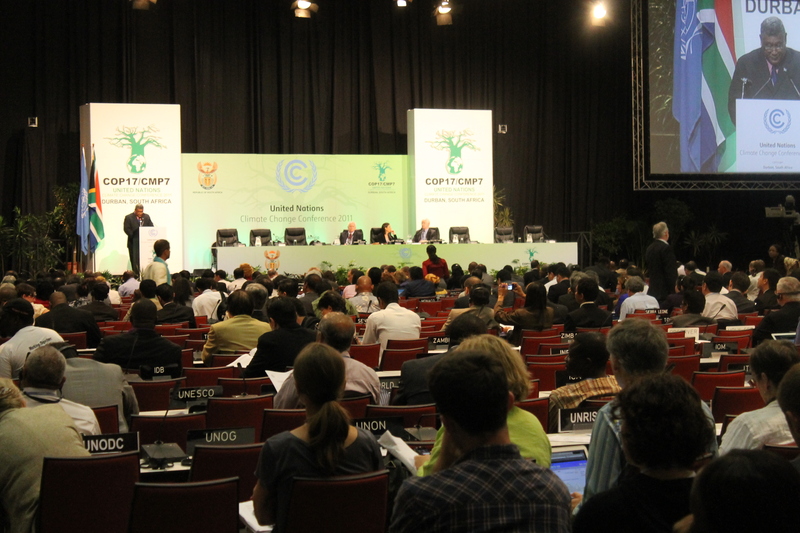 The sessions are meant to provide information on the status of the COP 17 negotiations to interested Canadians accredited as observers to the UNFCCC (comme moi). And four youth stood up, one even tipping his chair over, and stormed out of the room. While it was exciting, and it made their point, it also sent the message that “we can’t talk to you.” And as Moderator Mardi Tindal said, “Pragmatically, we need to find a way forward. We need to listen to each other long and hard enough, listen intently enough, to find a way forward because we can do nothing less.” To read about additional conversation between these youth and Paul Booth, click here. Seriously, when will our leaders and negotiators get it? And why does it seem like it’s only the youth who give a damn? Or is it only because we have less to lose by getting thrown out, and more to lose by not taking a stand? 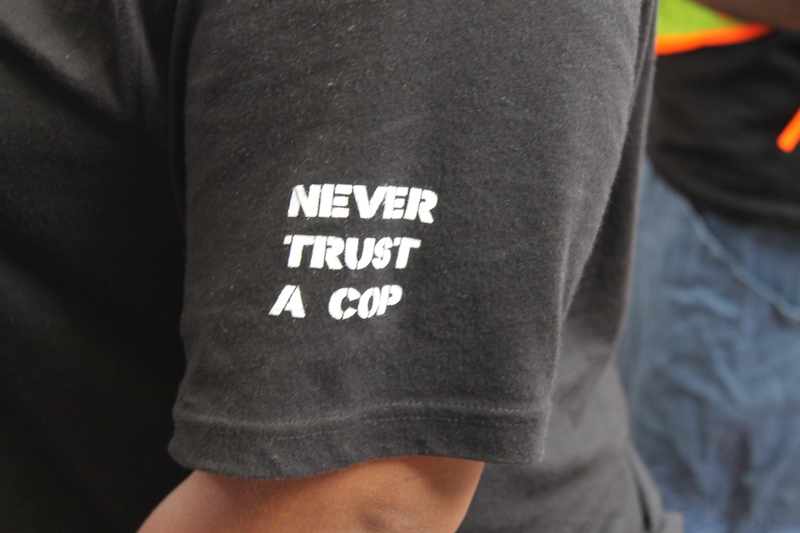 I’ve noticed that I have a few cool photos of activism from around the COP that I haven’t shown yet. So this is a bit of a fusion of those random photos and some of the cool COP-related activities that happened yesterday, my first day of accreditation. I was finally allowed inside!! Yesterday, I went inside the ICC (International Convention Centre) for the first time. It was pretty awesome to experience it. But it also made me realize, once I got in, how exclusionary the process truly is. 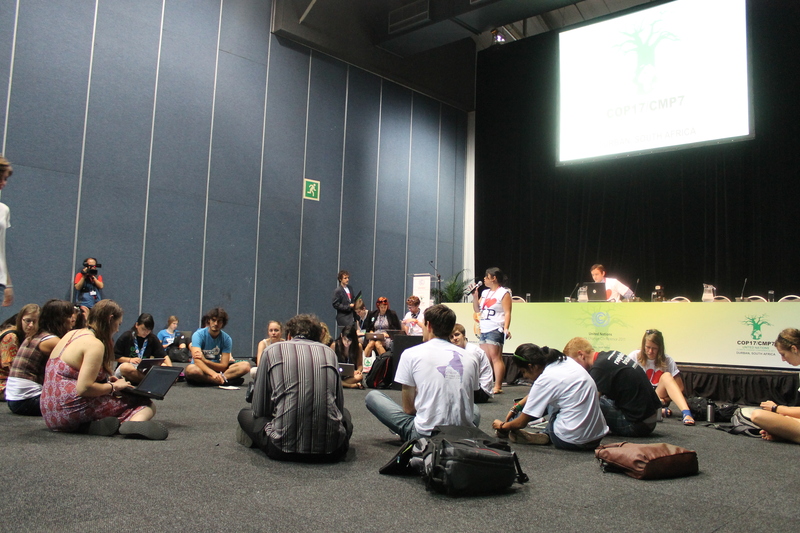 You need to be a delegate to get inside, and that can be a difficult process. Plus, not all the delegates have access to all the parts of the ICC process; as one of the KAIROS partners said on Monday, you really notice what colour your badge is (hers and mine are yellow, for NGOs). Today and tomorrow, you may even need a special ticket to get in to the plenary. It really makes me wonder how much say “the people” have in any of this. 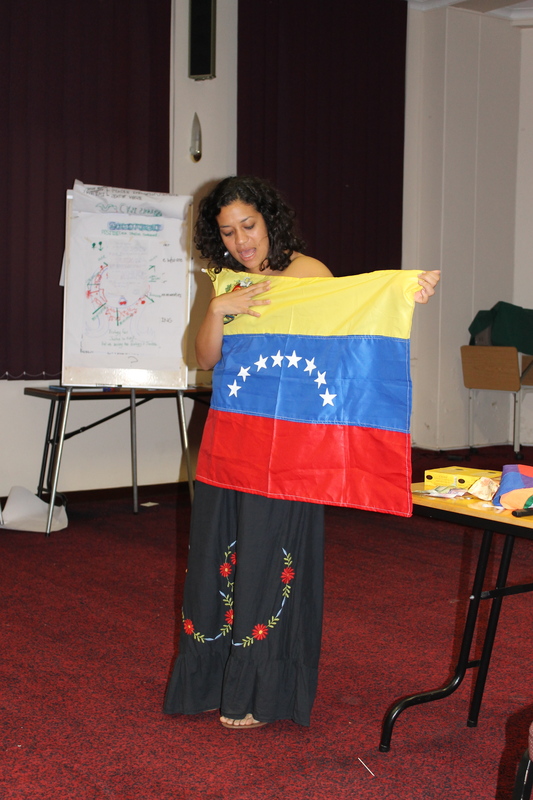 At the youth (Youngo) meeting that morning, I heard about, for the first time, a community about 20 minutes north of Durban that really felt the rains we all experienced on the eve of the COP. This community is called Kwa Mashu, and on that Sunday night, around midnight, there was huge flooding of the river. Homes were destroyed, and 10 people were killed. The community was frustrated with the media because the media would come in, do a story, and then just leave without having done anything for the community. People died the day before the opening of the plenary, from extreme weather. In their opening statement on the first day of COP, this group of young people who went to the community and made a short video of the aftermath were told (I’m not sure by who) not to mention that people had died in the floods before. How does that make any sense?!?! 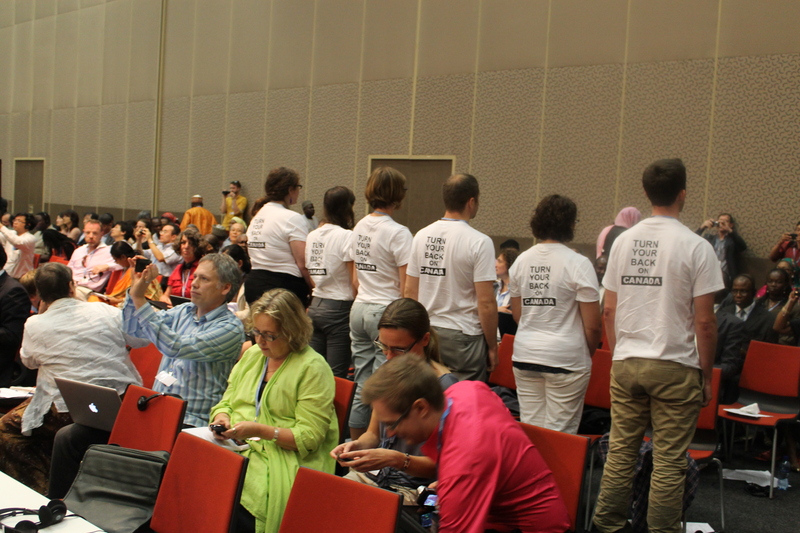 Then, I was able to get into the plenary, which was really cool. This is where all the representatives (heads of state, ministers, and I think a couple of princes thrown in) talk in front of all the other representatives, and the observers. I heard from the representatives of Singapore, Belize, Morocco, the Marshall Islands, Liberia, Tuvalu, Qatar, Sweden, Malta, the Maldives, Nigeria, and finally, Canada. All of the countries before Canada expressed how important the issue of climate change is for their countries. 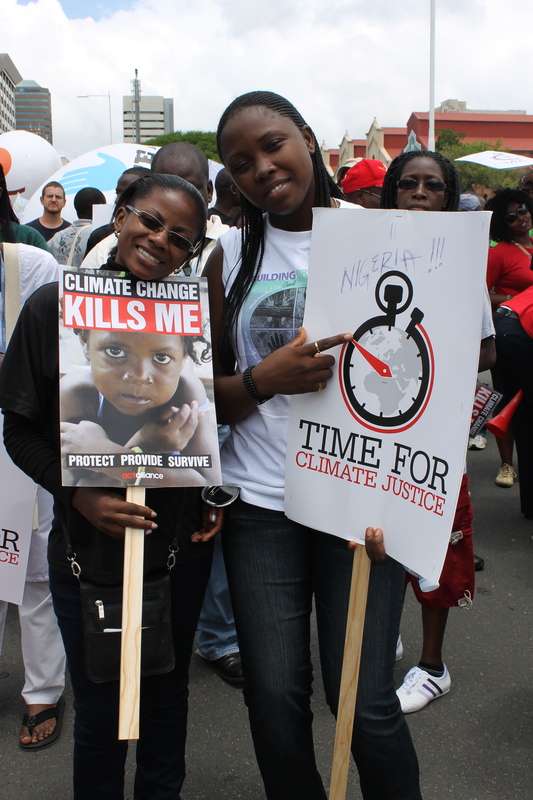 Many declared the importance of the Kyoto Protocol. Canada, obviously, did not. 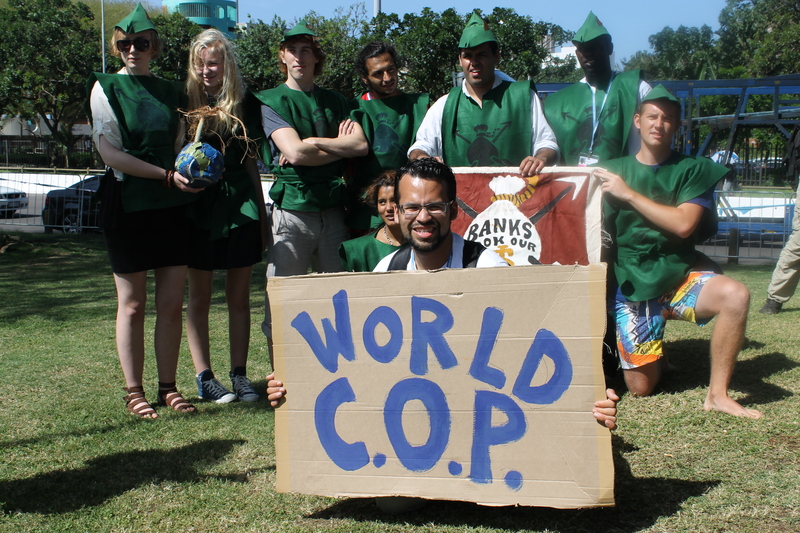 After this pretty intense plenary, we had some levity in the afternoon in the form of a mock soccer game between the 1% bankers/clowns and the 99% Robin Hoods. The prize? 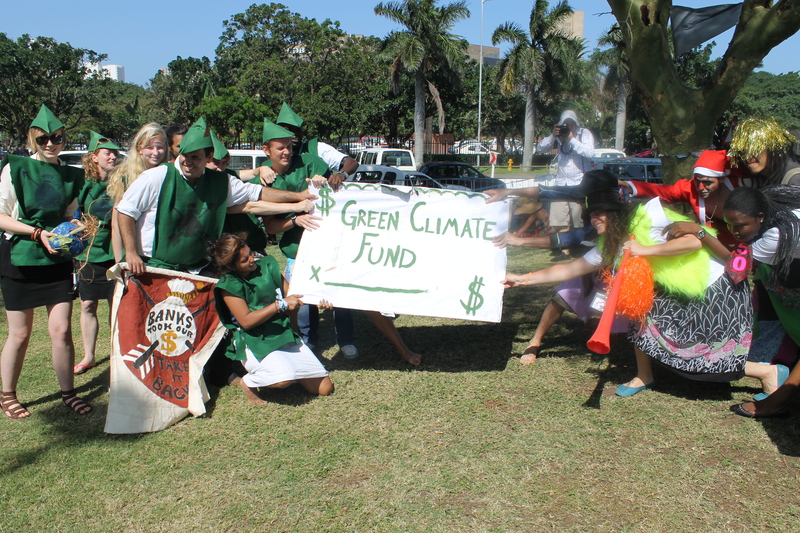 Control of the Green Climate Fund. 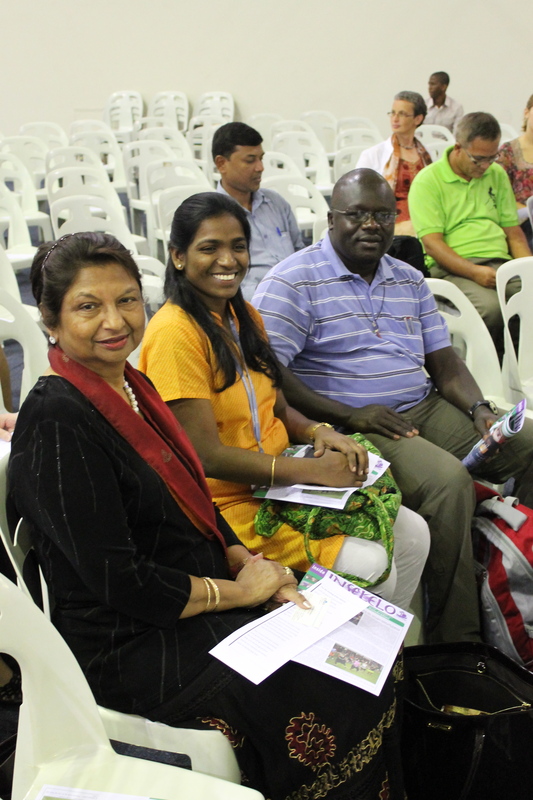 After the soccer match, I went back into the ICC and attended a panel discussion called “Climate Justice and Food Security: Moral, Ethical and Spiritual Imperatives.” Moderator Mardi Tindal was speaking on the panel, along with Rabbi Hillel Avidan (rabbi at the Temple David of Durban), Sister Jayanti Kirpalani (Regional Director, Brahma Kumaris World Spiritual University – Europe), Rev. Nicta Lubaale (General Secretary, Organization of African Instituted Churches), Bedria Mohammed Ahmed (Co-chair, Women of Faith Network, Ethiopian Interfaith Development Dialogue and Action), Presb. 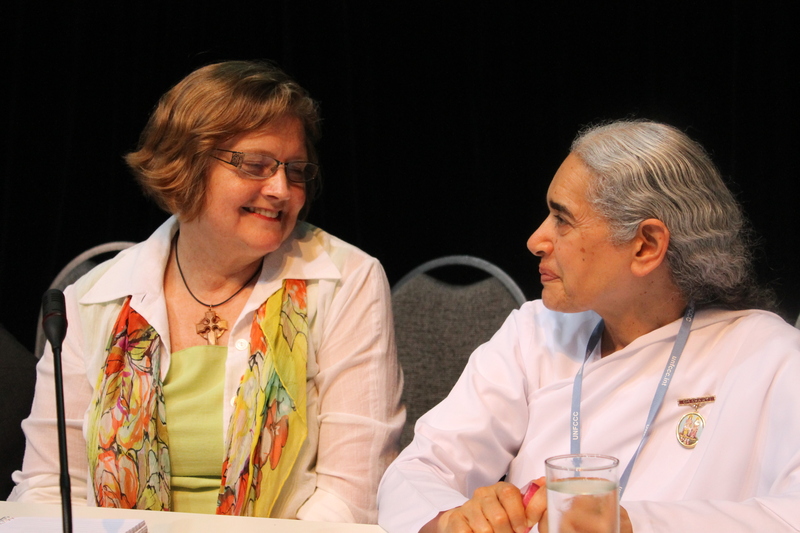 Patricio E. Sarlat Flores (Executive Secretary, Episcopal Commission of Caritas Mexico), and Dr. Ela Gandhi (Honorary President, Religions for Peace). 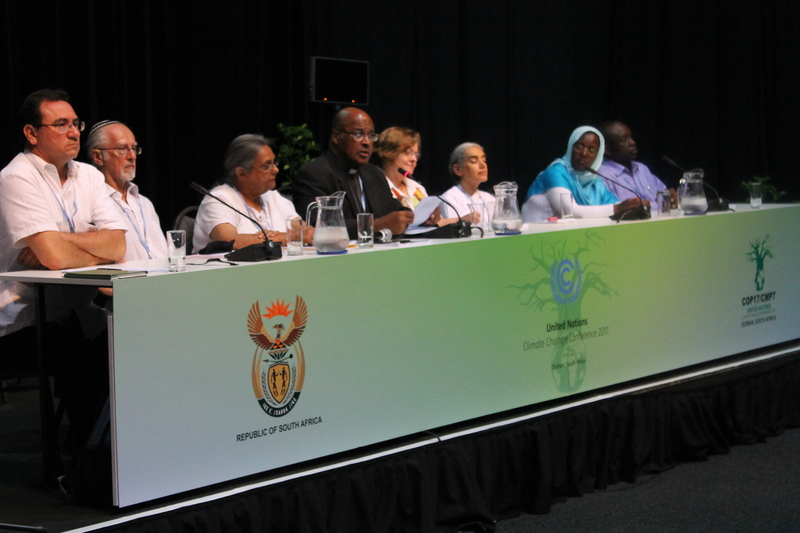 The panel was moderated by Cardinal Wilfrid Napier (Chair, KwaZulu-Natal Inter-religious Council). The Moderator said that Canadians expect more, and we are letting our politicians know that; she also spoke about the Canadian Interfaith Call for Leadership and Action on Climate Justice. Rabbi Hillel Avidan spoke of how, as time goes by, faith communities find that they have a lot in common, while Sister Jayanti Kirpalani spoke about respect, saying that we need to learn to respect ourselves before we can respect animal and plant life, and that respect is what’s missing from today’s world. Bedria Mohammed Ahmed told us that there are over 750 verses in the Qur’an that deal with the environment and maintaining the balance of creation; Dr. Ela Ghandi explained that even though all our scriptures talk about the climate, humankind has failed in maintaining this balance. Rev. 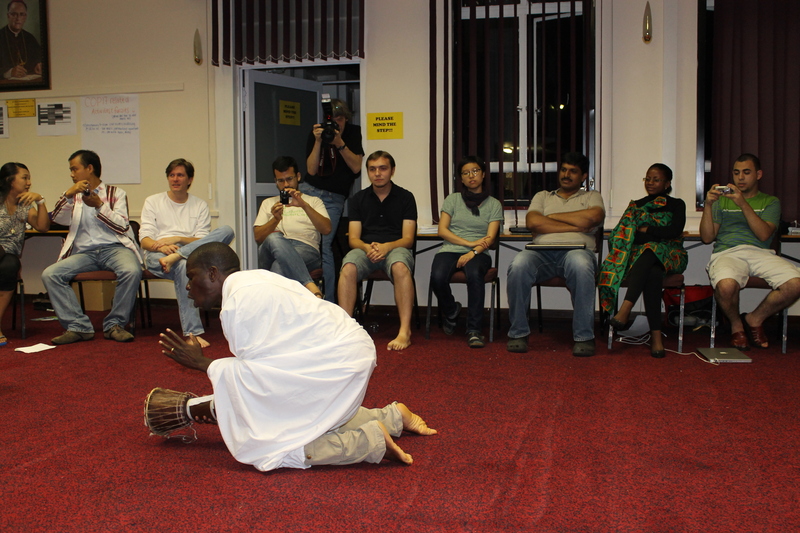 Nicta Lubaale told a story about traveling through Maasai territory in Eastern Africa. He had gotten out of his car, and his eyes were all red due to allergies. A Maasai woman came up to him, trying to sell him some goods she’d made. I experienced similar scenes when I was traveling through Kenya and Tanzania. But the woman noticed his red eyes, and she put the goods away, saying in Swahili “You’re sick, you’re sick.” Rev. Lubaale explained: “Her spirituality stops her from doing business when she realizes someone is weak, even if that person is richer than her.” I think that’s something we all need to learn. Sunday, as every Christian knows, is a day of rest. Well, for Caroline and I, it was anything but. It did include lots of worship, though! 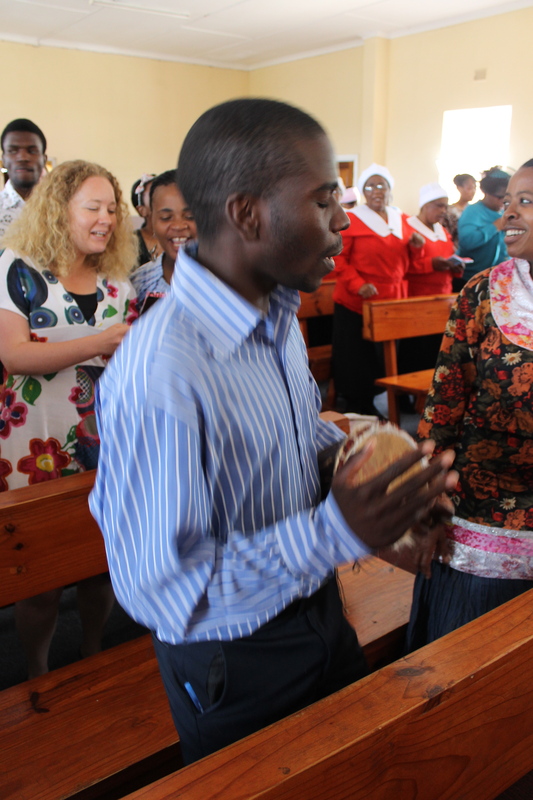 We went to a Methodist church in one of the townships on the outskirts of Durban. It was a very moving service, and also one of the longest I’ve ever been to (nearly 3 hours!). 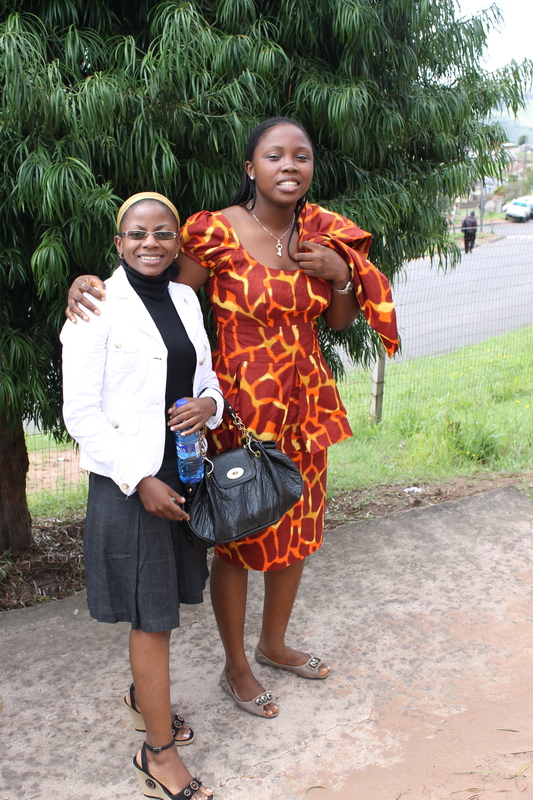 The congregation was super welcoming, both during the service and after. 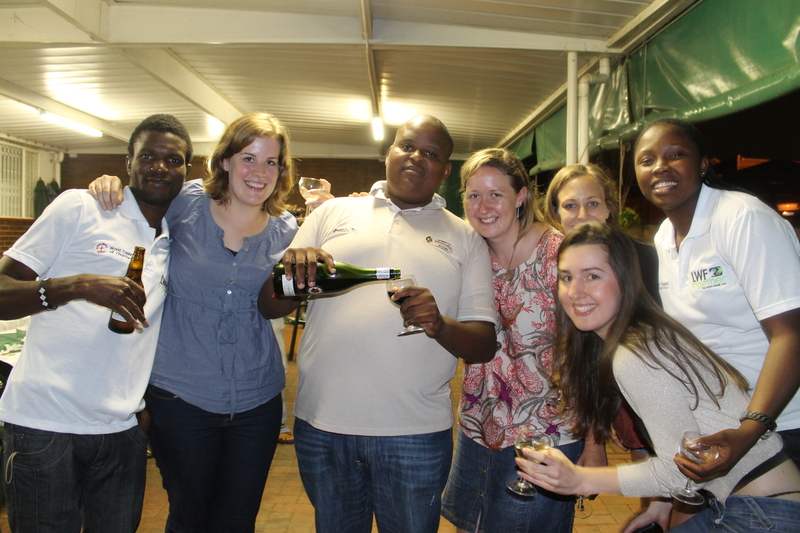 We all introduced ourselves, and Lungelo (from South Africa) from our group translated the Zulu sermon for us. 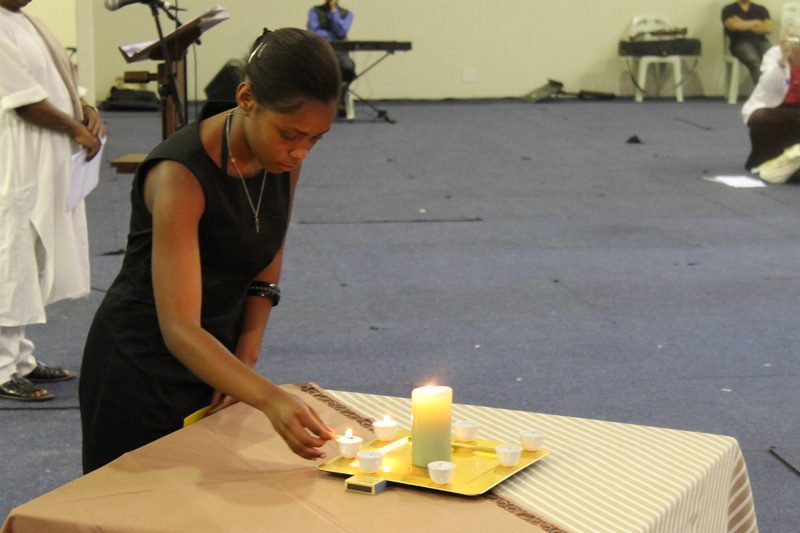 After the main part of the service, a woman came up and gave an informative talk about HIV/AIDs, including the use of condoms, to the congregation. 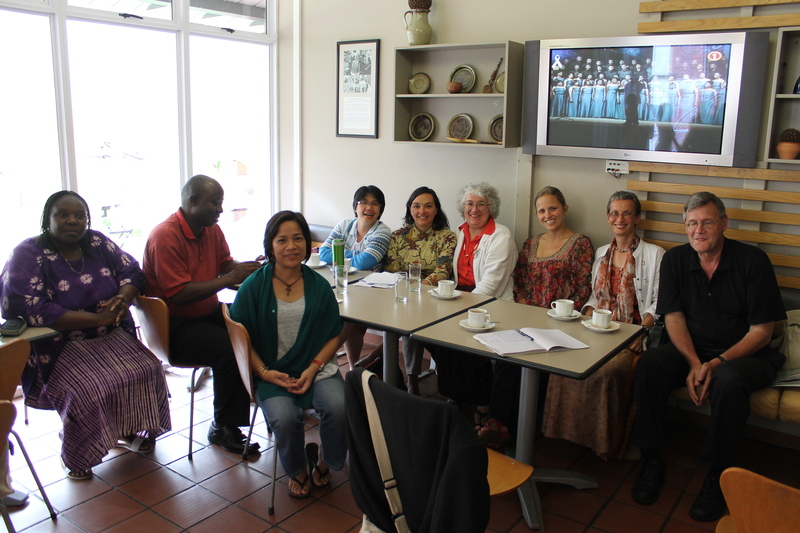 After the service, Caroline and I went downtown, back to the Diakonia Centre, for a meeting with KAIROS partners (some of whom are also UCC partners). It was an interesting journey to get there, which involved a jaunt in the back of a pick-up truck throughout the township. I was asked how I got out of the pick-up truck (I was wearing a dress). My answer: gracefully. Really, it was anything but. 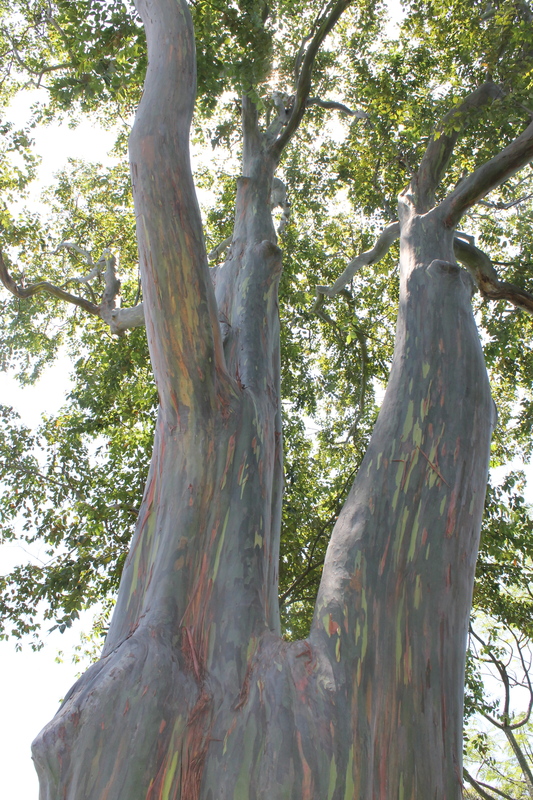 Jim Davis, of KAIROS, has written a fabulous blog post on the discussion we had. There were great songs throughout the service, as well as readings and reflections on the scriptures from different faiths. 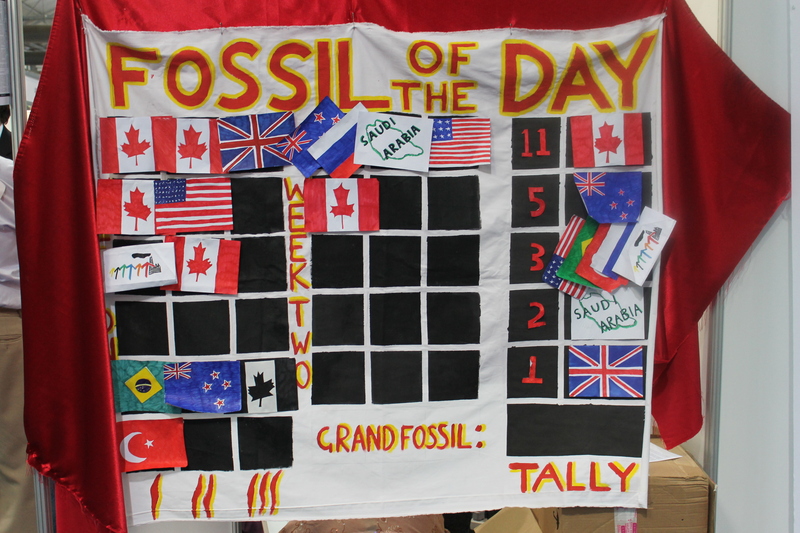 It really showed that, while we have our differences, we can come together on the important issue of climate change. Then on Monday, I went down to the ICC (International Convention Centre) for the first time. There’s a big part at the entrance to the ICC where anyone can go, filled with cool art installations on climate change and lots of booths on the issue. I’m trying to get accredited, but I’m not yet, so I can’t go right inside, where the other delegates go. 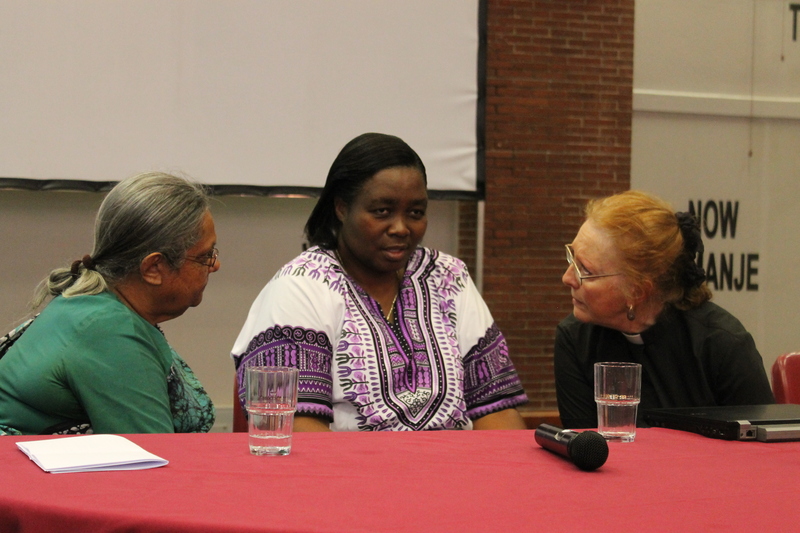 Monday was also the day I went to a Women Religious Leaders and Climate Change panel at the Diakonia Center. 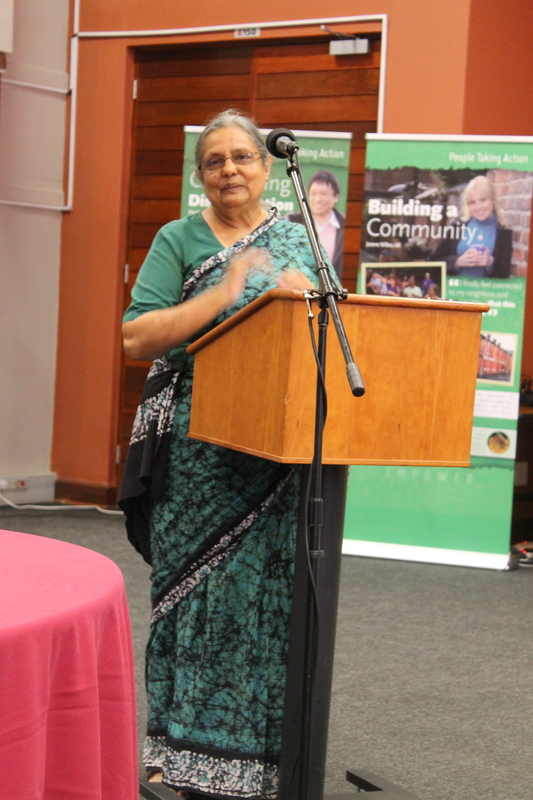 The panelists were Ela Ghandi (who happens to be Mahatma Ghandi’s granddaughter) from the World Council of Religions for Peace, Rev. Gugu Shelembe of the Thukela Amajuba Mzinyathi Christian Council, and Rev. 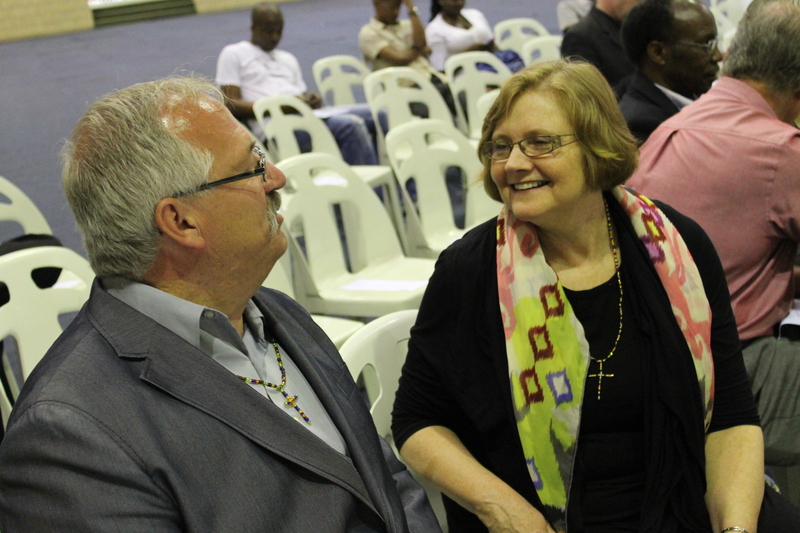 Priscilla May McDougal, from the USA (United Church of Christ). The most powerful feeling I was left with, and it was one of despair mixed with a new passion to get things done, was after Rev. McDougal said, while breaking down, “This conference is telling us that in 2020, this won’t be an issue anymore because we’ll all be burned…I have a beautiful granddaughter and I want her to live in a world where she won’t be cooked. Future Genocide in South Africa? 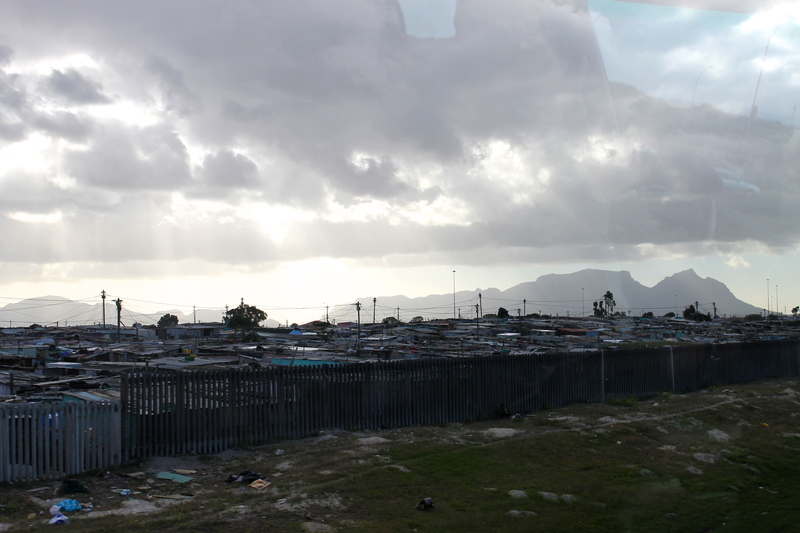 When I arrived in Cape Town, I was keen to learn about the history of Apartheid. Both my undergraduate and postgraduate studies have focused on international human rights violations, particularly genocide, ethnic cleansing, and war crimes. 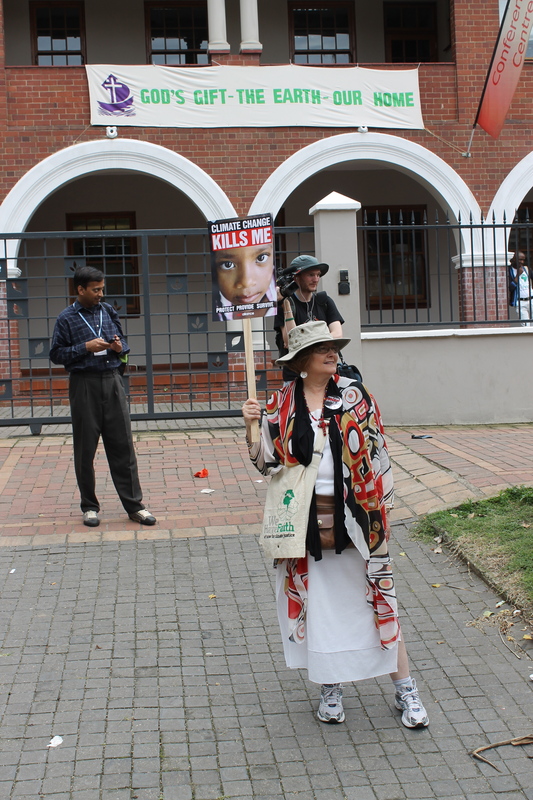 Apartheid is up there as one of the worst systematic violations of human rights, in place from 1948-1992. I actually didn’t realize that it began in 1948; I thought it was sometime in the 1950s. The reason 1948 surprised me so much is because it was only 3 years after the Holocaust. You’d think that after such a horrific example of the ultimate form of racism and prejudice, people would be less inclined to create a similar system. Especially because a lot of Jewish people (albeit white Jewish people) emigrated to South Africa. Although I guess we only need to look at Israel to see that victims often become perpetrators of collective punishment and other forms of human rights violations. 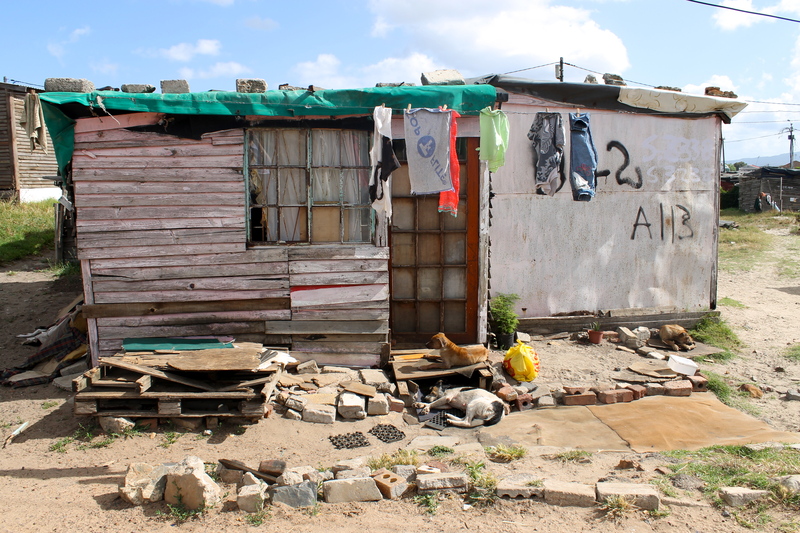 And then I arrived in South Africa, and learned that it is the most unequal society in the world; the gap between the riche and the poor is the largest of any country. This inequality is certainly not conducive to peace. Soon after arriving in Durban, I heard about a “white” genocide in South Africa. At first, I doubted this. It sounded similar to what white supremacists say about such things as intermarriage or immigration. And I’d also heard about the white South African who got asylum in Canada, and everyone kinda dismissed that as being a pretty wacky decision. But then I looked into it, and while I wouldn’t necessarily label what’s happening in South Africa as “genocide,” it’s definitely disconcerting. And it’s not only against white people. 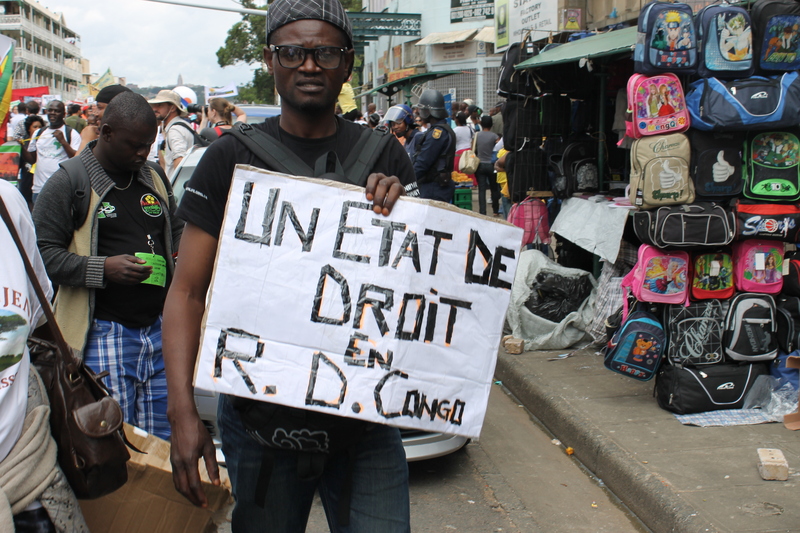 Some refer to a new kind of apartheid in South Africa – xenophobic violence aimed at African refugees, especially those from Zimbabwe. 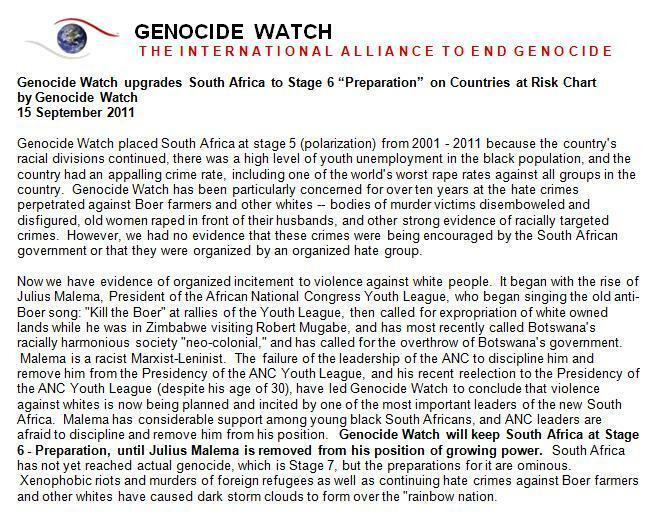 And even more alarming, Genocide Watch has placed South Africa at a 6 – “preparation.” 7 is actual genocide. And since I’ve been here, I’ve witnessed this fairly extreme racial tension. First, many of the roads around Durban have been renamed, and apparently in some of the mainly white areas, where the street names are now named after Black militants, the names have been scratched off the signs. Second, at the Global Day of Action march on Saturday, things turned a bit political and songs were sung essentially saying “bring me my machine gun” and “kill the Boer.” The important thing to note here is that there are two main white communities in South Africa – the British-origin South African and the Afrikaaner. The British South Africans, generally, were against Apartheid and now refuse to speak Afrikaans, as it is seen as the language of the oppressor. “Boer” is the Afrikaans word for farmer, and now (I think – I’m a bit confused about this part – South Africans please correct me) generally refers to white people or white farmers now. And there have been many cases of Afrikaaner farmers being killed, often in incredibly grotesque, horrible displays of sadistic torture. 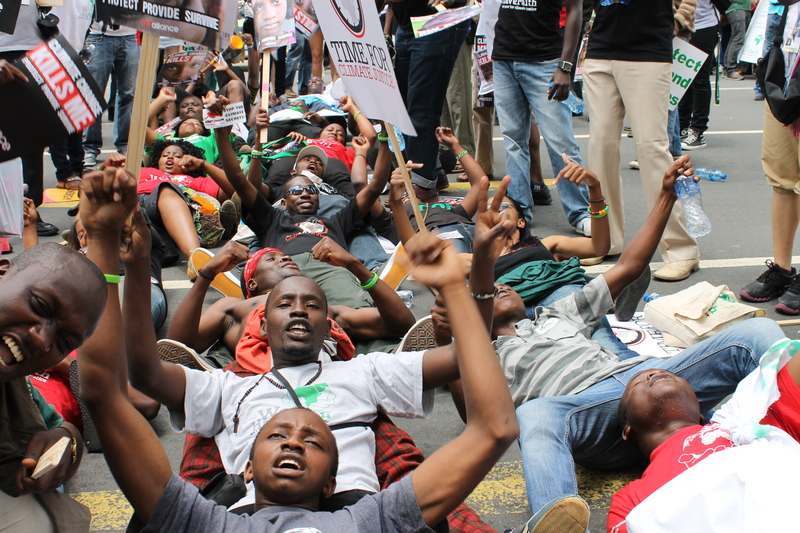 But the most alarming example I personally witnessed here in Durban was at a gathering of South Africans and Zimbabweans, demanding land reform, which is something, in theory, of which I am in favour. But not in the way it was expressed here. 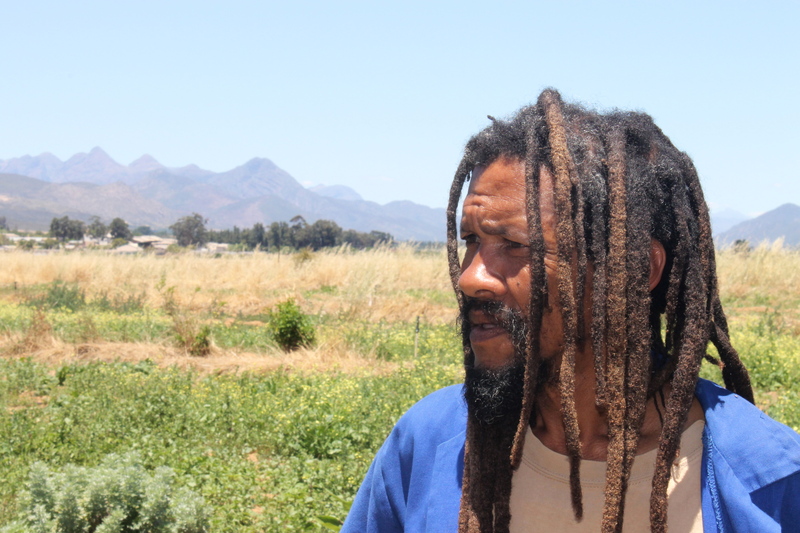 The Zimbabweans present spoke up and told the South African farm workers that they should learn from the Zimbabwean example (namely – getting rid of White farm owners). Zimbabwean veterans were mentioned as being particularly useful, and from my understanding, they violently threw the white farmers off the land. 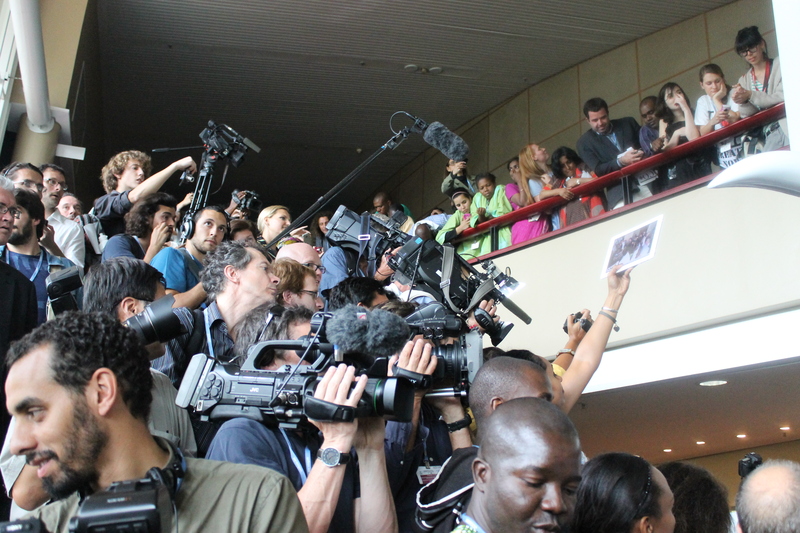 There were also shouts of support for Mugabe, which was disconcerting. Even Nando’s (a popular South African restaurant) has a commercial depicting Mugabe as the last dictator standing! As I said at the beginning of this post, today is Canada’s National Day of Remembrance and Action on Violence Against Women. Twenty-two years ago today, on December 6, 1989, 25-year-old Marc Lépine entered the École Polytechnique in Montreal, Quebec, Canada and shot twenty-eight people before killing himself. Armed with a (legally obtained) semi-automatic rifle and a hunting knife, Lépine killed 14 women. His suicide note blamed feminists for ruining his life and included a hit list of 19 Quebec women who Lépine viewed to be feminists and wanted to kill. In the aftermath of this tragedy, Canadian gun control laws became much more strict. Now, our Conservative government is in the midst of repealing that legislation. 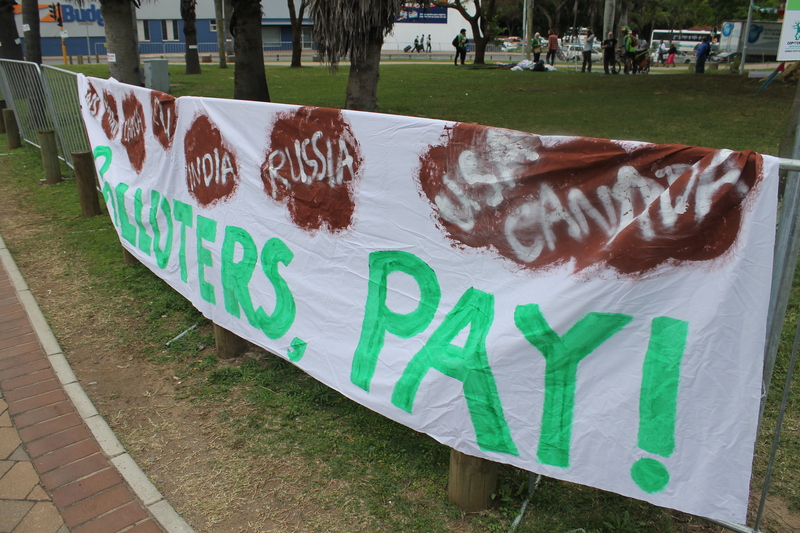 Saturday was the Global Day of Action. 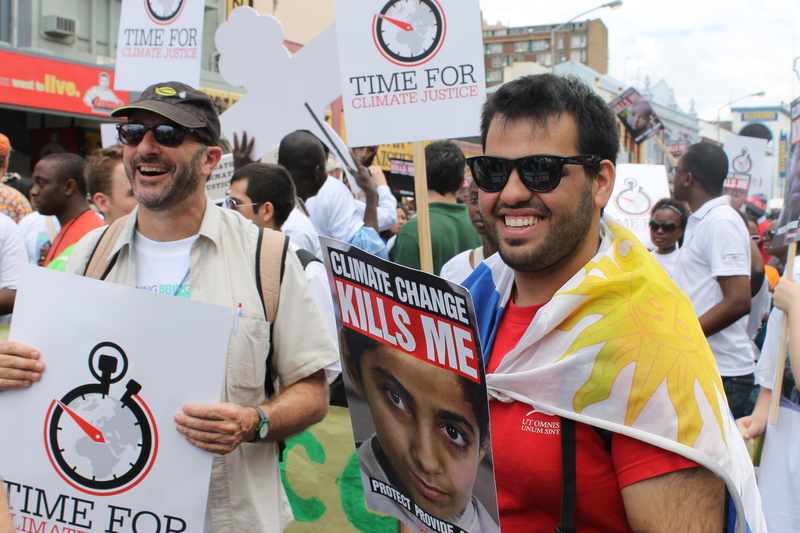 Demonstrations against climate change took place around the world, including in Toronto. 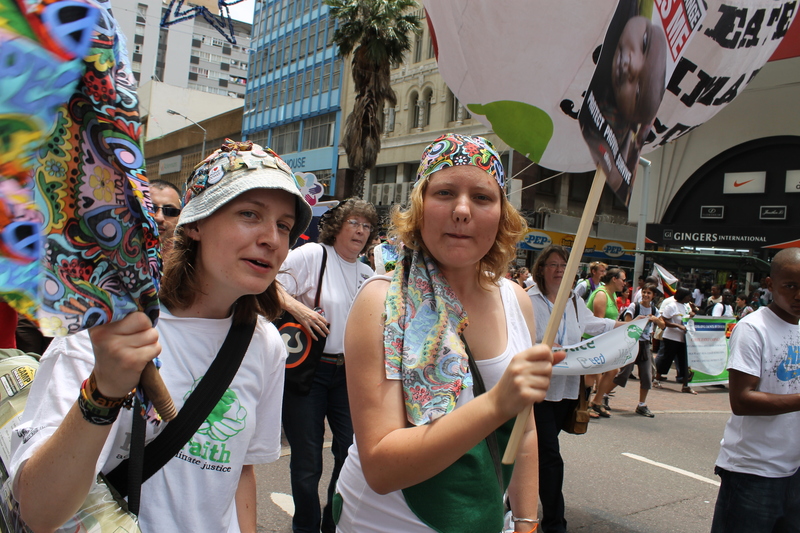 In Durban, civil society gathered for COP 17 marched through the streets, attracting a lot of curious onlookers. 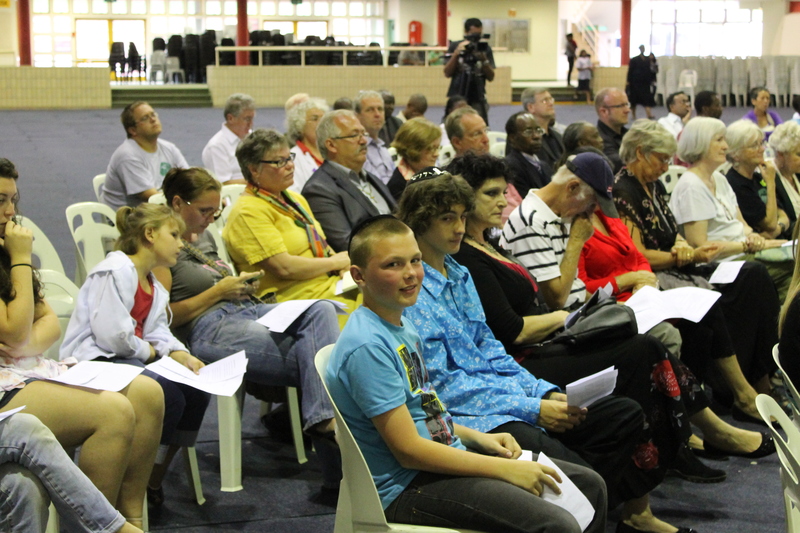 The faith contingent met at the Diakonia Centre in central Durban. 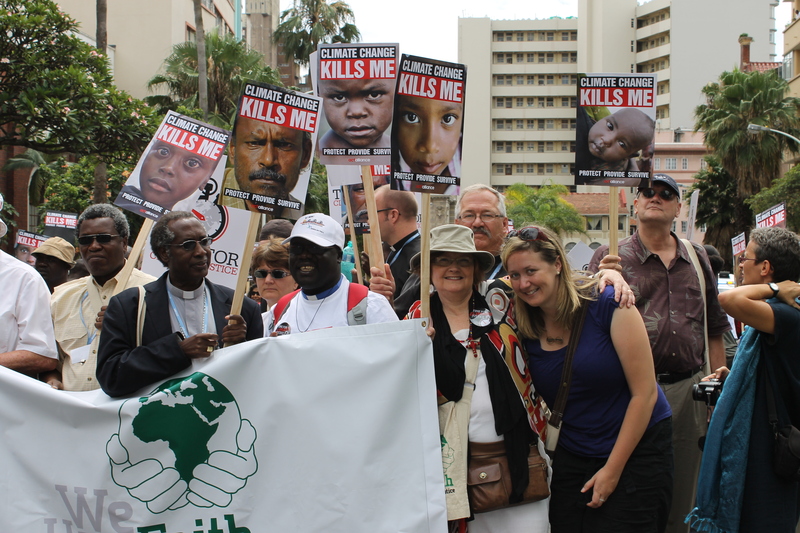 Canadian faith leaders Willard Metzger (Mennonite) and Moderator Mardi Tindal (UCC) were two of the faith leaders who marched at the front, with the We Have Faith banner. 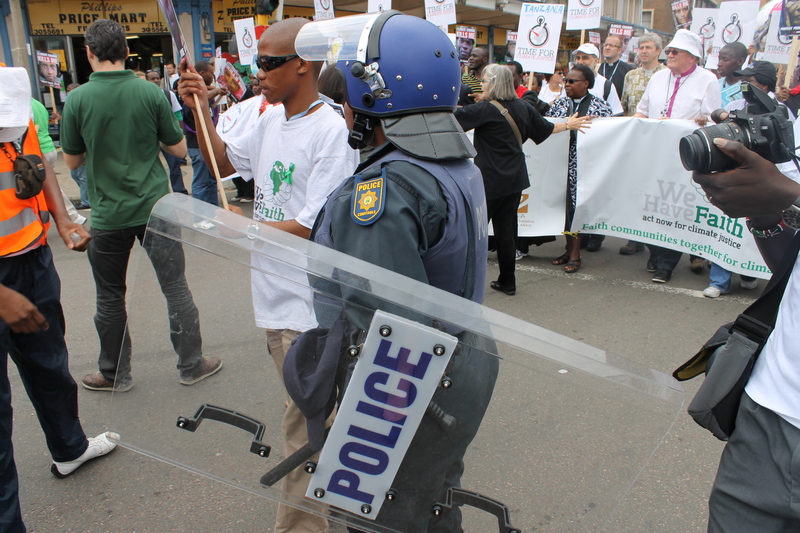 To get to the Diakonia Centre, we hitched a ride from the Glenmore Pastoral Centre with the “We Have Faith” caravans that travelled from Nairobi to Durban in the weeks preceding the COP. 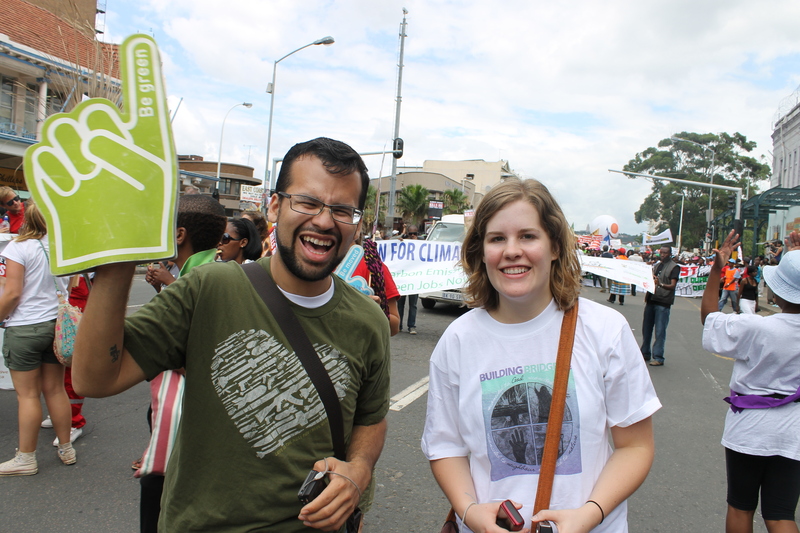 I’ve spoken to many of the participants of that journey (Claire from the UK who’s part of Youth for Eco-Justice was also part of it), and seen some video clips, and it looked amazing!! Reports vary, but there were anywhere from 3,000 to 20,000 people marching that day. It certainly felt like many more; George, who took my video camera and climbed onto a terrace of a building to get an aerial shot, told me that he tried to see the beginning or the end of the march, and he couldn’t. There were that many people. 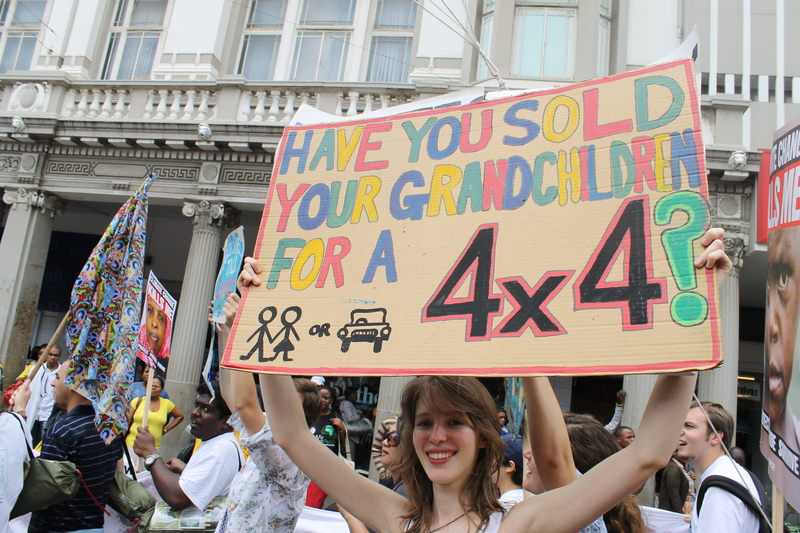 Youth for Eco-Justice at our best! Some of the most powerful songs, chants and dances of protest took place while we were waiting to join with the wider rally. There was a large contingent of youth who have travelled on the caravans. 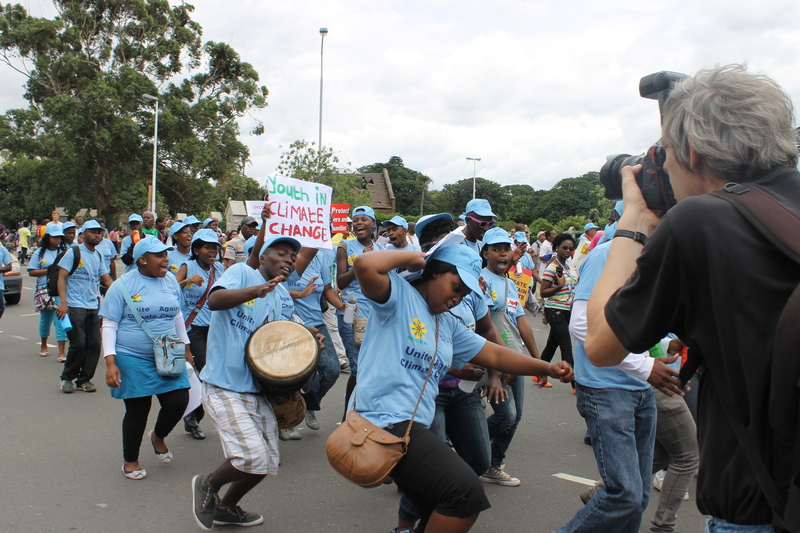 They were a vibrant group leading others in the chants and songs. One in particular stood out to me. 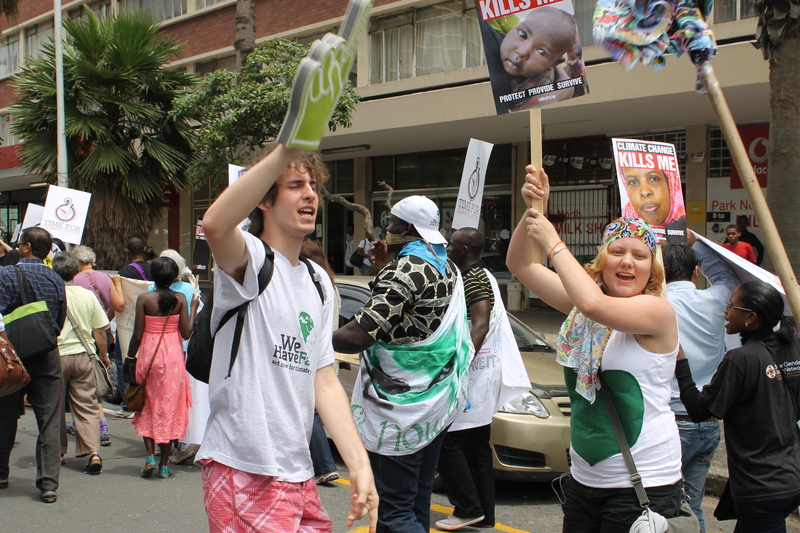 One young person began by calling out “hello?” to which everyone else in the group would respond “hello!” and this was repeated several times before the leader would give a statement such as “we came from all across Africa and will not leave without being heard” after which everyone would cheer. I found this particularly relevant as it is pertinent to the situation that our calls are answered. It is one thing for us to call out, but who is listening and who will answer? This chant demanded a group response that all were eager to give. “This is our future,” they said “and not their future.” They were very clear that they have heard enough talk. It’s time for action. The police presence was exceedingly high. At previous rallies I’ve been to, I’m never sure if the police are there to protect the public from us, or us from the public. At London’s (UK) Reclaim the Night march that I participated in 2 years ago, the police were definitely there to protect us. At this march, I wasn’t so sure. Mainly because the majority of them had riot shields, and they were plainly blocking us from entering certain establishments (such as McDonalds…not sure why…and a hotel). And we spotted police with guns on the tops of buildings along the route, particularly at the intersections. 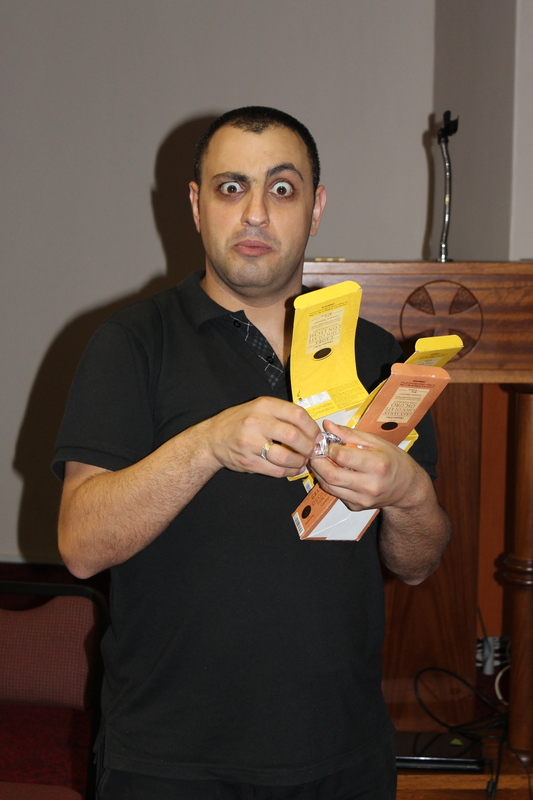 It was a bit unnerving. This all made much more sense to me when I heard about the Hilton here, where some of the more high-powered delegates are staying. 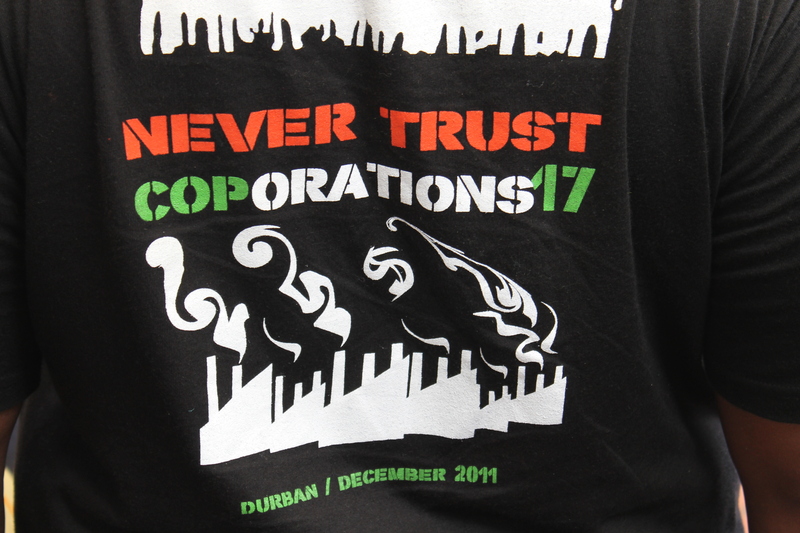 It’s entirely rented by COP17, and they have security on the premises who only let people in who are staying there. Us peasants can’t even go into the boutique if we wanted to. It demonstrates what I’ve been feeling a lot, that this COP is really separating people – those who have power, and those who do not. I’ve been feeling quite isolated from what’s happening inside COP, and after hearing about this, and seeing all the police, I’m not surprised I feel that way. After the march, we headed down to the beach for some lunch and to see the exhibits for COP along the beachfront. There was also a concert on the beach in the afternoon and into the evening, when there was an NGO party. 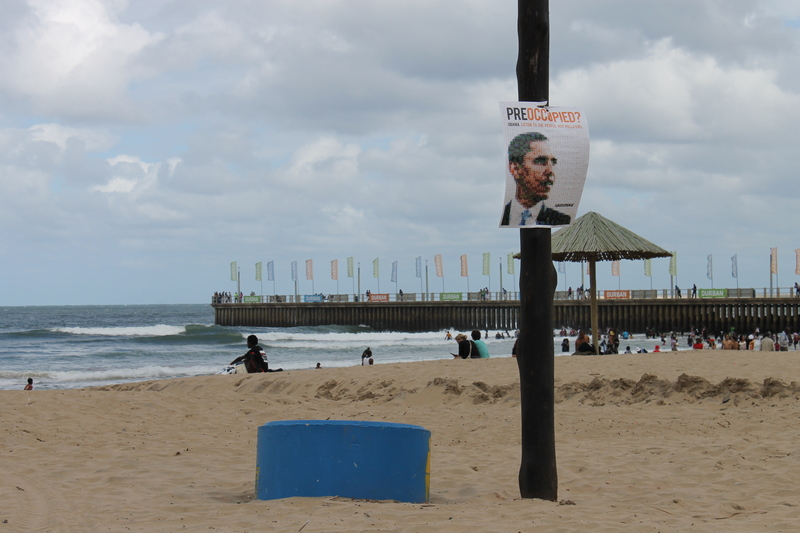 I saw this interesting sign of Obama on the beach. And as we were traveling back to where we were staying, I also saw signs with Harper’s mug on them. 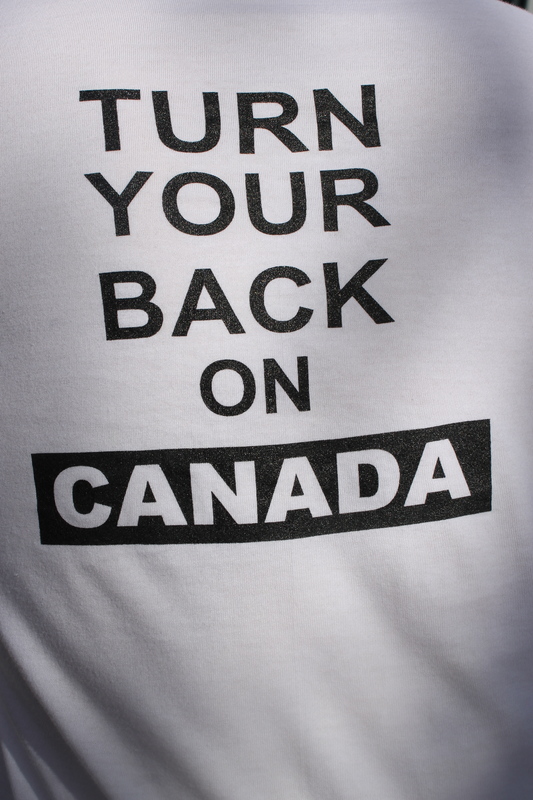 Canada, seriously – what are we doing with a majority Harper government?? I’ve never seen my beloved country in such a sorry state, nor have I ever been more nervous about my own rights and freedoms. Or the survival of Earth. Will this beach still be here in 20, 50, 100 years? 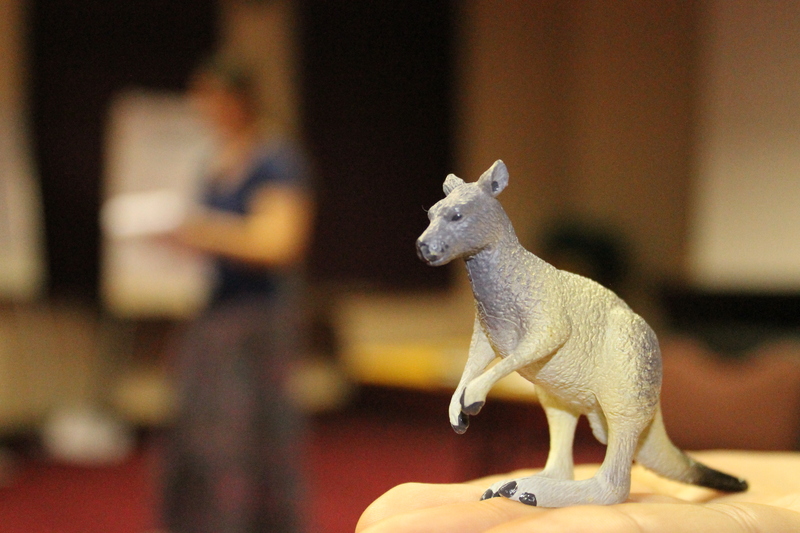 On Wednesday, we looked at theological and ethical perspectives on creation and on justice. This consisted of some very interesting lectures and discussions, around such questions as “Did the leaves fall from the trees in the Garden of Eden?” It was deep. Caroline and I were tasked with the evening prayer that day. We wanted to bring a very Canadian feel to this prayer, so we incorporated some United Church of Canada and KAIROS resources into the service. It was very important for us to include an Aboriginal element to the service, and to what we bring to the program as Canadians. Of course, I in no way am speaking on behalf of the Aboriginal peoples in Canada, nor do I presume to be an expert on Aboriginal issues. In fact, I have a lot to learn. And I want to learn a lot more. I just want to make sure that the views I bring from Canada are not solely a white, middle-class, female perspective, but include other voices, especially the voices of our original inhabitants. And we’re doing that not by speaking for them, but by including examples of climate change in Canada that specifically affect Aboriginal communities, relating things that Aboriginal people have directly told us, and including Aboriginal spirituality in our services. 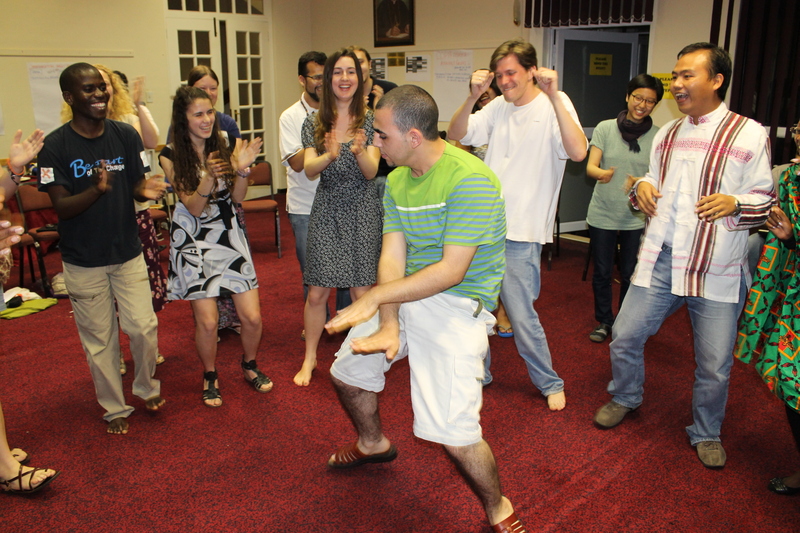 We did this on Wednesday by using a prayer, from a KAIROS resource, that focused on the Four Directions, and had the youth participants move to the East, South, West, and North for different parts of the prayer. Instead of a hymn, we used what I called “an alternative hymn.” At the North American Forum and Hearings on Poverty, Wealth and Ecology, one of the participants, David Greenfield of the Religious Society of Friends (Quakers) in Saskatchewan performed a song he wrote at the Occupy Calgary site. We taped it and put it on youtube, and so Caroline and I decided to share it with our fellow participants. 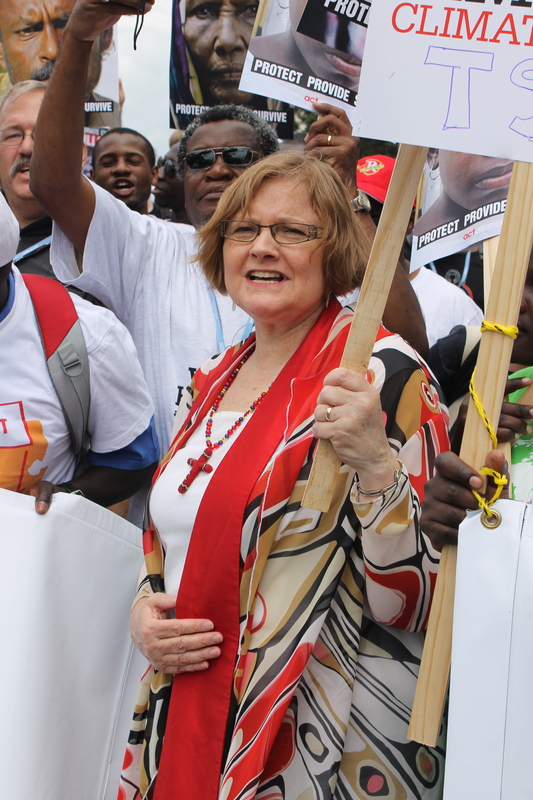 Speaking of Occupy, people interested in Israel/Palestine should read this post by United Church of Canada Ecumenical Accompanier Jan McIntyre. Wednesday evening was pretty awesome. 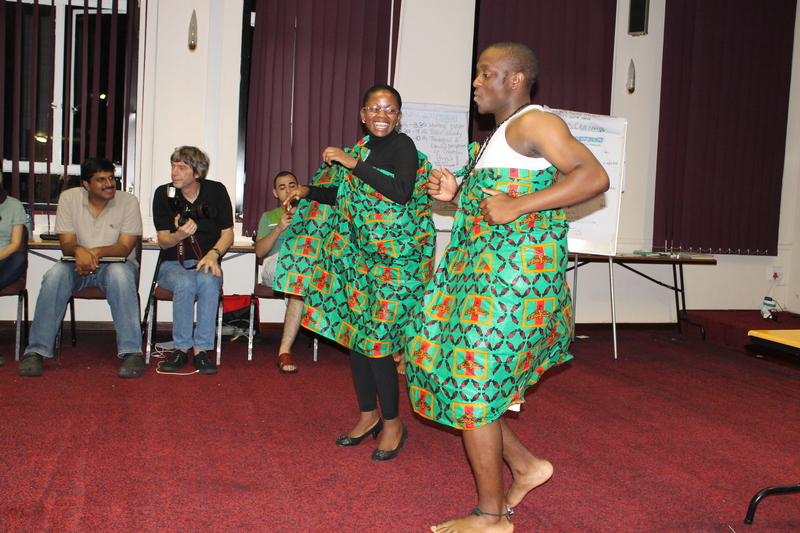 It was Part 1 of our Cultural Night, and there were many different cultures on display. Some danced, some played instruments, and some, like Caroline and I, showed a beer commercial. C’mon, doesn’t every Canadian love this commercial? ?